Many thanks to everyone who came along to our fundraising ceilidh in March. Over 200 folk joined us on the top floor of the Teviot for 5 hours of ceilidh and pipe band music. The following weekend we dipped our toes into the 2017 competition Season with the Lothian Borders Branch indoor competition in Livingston. Our G4 band placed 2nd and 3rd and our G3 band placed 3rd in G3 and 4th in G2. 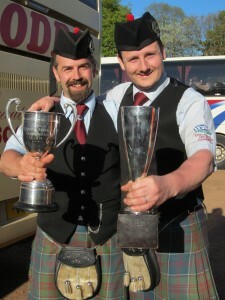 Congratulations to Davidson’s Mains, Wallacestone and George Heriots School pipe bands who won each grade respectively. Many thanks to all who competed, the Black Wolf Brewery for their support and the Scottish Arts Club for their hospitality. The band are back preparing for the Season ahead after a brief break. We’re pleased to welcome some new faces to both bands and bid farewell to a few folk too. Most notably to Ange Hague and Tony Park who are making the move up north for work and will be out with the Grampian Police pipe band this summer. Both have been stalwart members of the band for several years and their commitment and enthusiasm will be missed by all. Although it’s been a while since we posted an update, we have been keeping busy! Early in November we were delighted to field two bands as part of the city’s Diwali parade; along with the Erskine Stewart Melville College and Haddington pipe bands we entertained the crowds outside St Giles Cathedral before parading down The Mound and into Princes St Gardens. And yesterday we led the annual charity Stockbridge Santa parade though Stockbridge into Inverleith Park. Next Sunday, you’ll find us in Princes St Gardens for the annual Wish Upon A Star charity Santa Stoll and we’re delighted to announce that we will once again be joining the Scottish Fiddle Orchestra for their annual Hogmanay concert at the Usher Hall on the 30th December. And we’ll also be welcoming guests to the Lord Provost’s Christmas Reception at the City Chambers later this month too. The first weekend of the month proved busy and successful; on the Saturday we travelled down to Peebles Highland Games for the penultimate competition of the Season. Our G4 band placed 4th out of 10 bands, G3 won best drum corps and placed 2nd in Grade 3 and then won Grade 2. As ever, there was a wee parade through the town after which we were also awarded the parade prize cup. And as tradition beholds, we played our way in to the Green Tree Hotel much to the enjoyment of the clientele and would like to extend our grateful thanks for the generosity of the hotel for filling said prize cup to the brim with some mighty fine Port! On Sunday we were up on the Mound Precinct in the city centre from 10m to 4pm undertaking our annual fundraising Pipebandathon. For 6 hours solid, our intrepid musicians played in uncharacteristically sweltering heat, performing a variety of full band, mini band, duos and solo sets to constantly large crowds, helping to raise a very encouraging four figure some towards our band funds. On Wednesday 7th, the band performed at an evening corporate reception in the main gallery of the Museum of Scotland on Chambers Street. The final competition of the Season came round as quick as ever. The band travelled down to Innerleithen for the final Branch event on Saturday 10th September. Our G4 band placed 5th, our G3 band won both the drumming and band prizes in both G3 and G2 before going on to retain our Branch Champions title for another year. We now turn our attention to our two trips to Switzerland as well as new competition material for the 2017 Season. Both bands enjoyed decent results at the North Berwick competition on the 6th August; our Grade 4 band placed 5th out of 10 G4B bands in the open event and 2nd in the Branch confined whilst our Grade 3 band won both the open and confined drumming, placing 4th out of 8 bands in the open and 2nd in the confined. And our DM placed 2nd in the confined adult DM competition. Whilst most of us were busy concentrating on the imminent World’s competition one band member added a couple more prizes to their haul! Congratulations to G4 band member Andrew Richardson who placed 2nd in the Piobaireachd ground, 2nd in the Strathspey and Reel and 3rd in the Jig at the PipingLive Grade 3 CLASP ‘World Solo Amateur Piping Competition’ on Tuesday 9th August, held at the National Piping Centre and judged by Connor Sinclair and Sandy Cameron. So the pinnacle of the pipe band year came and went and whilst both bands enjoyed a good day out at the World’s, disappointingly, there was no silverware ensnared. Our G3 band qualified and our drummers did however place 3rd behind two non-Scottish bands in the final, which brightened up a very long and late prize-giving on The Green. Congratulations to all L&B Branch bands who made the prize list. To compensate for the weekend before the band enjoyed a successful trip to Dunoon to compete at the Cowal Championships. Frustratingly, our G4 band placed 5th equal with 2 other bands out of 14, losing out on the 5th place prize by one point. Our G3 band placed 3rd in the MSR comp, 3rd in the medley and also placed 4th in G2, beating a couple of G2 bands. Our G3 drummers won the G3 medley comp and came 2nd in G2 beating several G2 drum corps! What with the excellent weather, the great Cowal atmosphere, some excellent bands in the ceilidh tent (including Skipinnish) the historic trophies and Pirate-themed accoutrements for the street parade, it was a very lively bus journey home and a very enjoyable 18hr round trip. Many thanks to Hamilton Scaffolding and the Black Wolf Brewery who sponsored the trip and helped with the costs. Here’s to next year! It’s been a busy fortnight for the band since returning from our mid-Season break. As well as the twice weekly practices, we’ve performed for three Weddings; two mid-week on the 20th and 27th July at Balbirnie House Hotel in Fife and one Sunday on the 31st July at the Ghillie Dhu in Edinburgh. On Saturday 23rd July we travelled over the Forth to compete at the local Burntisland competition. Many thanks to our DM Michael Binder for stepping in to play bass with the G4 band. Whilst there were no prizes for the G4 band, the G3 band did manage to pick up a couple of second places in G3 and G2. Our final competition of July was across in Dumbarton at the Scottish Pipe Band Championships. Seven was the unlucky number for both bands; our G4 band placed 7th in their qualifier and our G3 band placed a credible 7th out of 16 bands. Our focus now turns to August with less than two weeks until Piping Live, the Pre-World’s concert and of course, The Worlds! June kept us nice and busy, particularly on the weekend of the 14th/15th. On the Saturday, the G4 band led the Kirkliston Gala parade under cloudy but dry skies. Many thanks to Alistair Russell for stepping in to play bass. Then on Sunday we headed up to Glamis Castle to compete at the Strathmore Highland Games which thankfully yielded prizes – 2nd in G4b, 3rd in G4a, 2nd in G3 and 1st in G2. Finally, we then returned south to perform a Wedding Beat Retreat at Dundas Castle which went down a storm with the 100+ guest who assembled at midnight to hear us play. Well done also to our DM who placed 3rd at Adrossan Games. At the end of the month the band travelled north to Aviemore for the customary 3-day event that is the European Championships. Congratulations to our drummers on being crowned G3A European Champion Drum Corps!!! A amazing result and worthy reward for all their hard work. The G3 band finished in 5th place overall whilst the G4 band finished 7th in their heat, just missing out on a place in the Final. Both bands enjoyed another lovely trip to Forres with our customary stay in Aviemore; another great event which we’re already looking forward to returning to in 2017! The first outdoor competition of the Season was a rather pleasant affair, with the sun basking the bands at Dunbar on the 14th May. Always a nervous day as months of preparation are put to the test under the scrutiny of a full panel of judges! Our G4 band did well, placing 7th out of 14 bands – a couple of 4th places perked up the results and the debut of our new snare line who did an excellent job on this first outing made for a good day. G3 placed a disappointing 8th out of 10 bands but there is time before the next outing to work on this and improve. The band have been quietly working away over the past few months preparing for the 2016 competition Season. We had our first competition on Saturday 16th April at the Lothian and Borders branch indoor competition; our G4 band placing 2nd and 4th and our G3 band placing 2nd and 5th in the mini band events with the G3 band playing up to the G2 full band event and placing 3rd. We also had a number of younger members competing in solo events and whilst none made the prize list they all acquitted themselves very well. The previous Saturday the band were busy providing a solo wedding piper in South Queensferry, a solo piper for a corporate supper at Surgeon’s Hall, Edinburgh and a solo piper, highland dancers and a pipe band for a wedding at Hopetoun House. During late March the band performed twice for U19 international rugby fixtures at Inverleith and Meggatland, providing pre and mid match entertainment duties as as well as performing the all important National Anthem. Earlier in March, the band held its fundraising ceilidh at Teviot House, Bristo Square, Edinburgh. Over 250 folk with guests from as far away as Canada, Turriff, Thurso and Cardiff hoolied until the wee small hours with the Canongate Cadjers providing the music. At the end of January, the band performed at the EICC, playing on stage to open and close for a corporate event as well as providing some entertainment in the main foyer. On Saturday 19th, the band undertook two engagements – a quartet entertained guests arriving at the Lord Provost’s Christmas Reception at the City Chambers before a full band travelled out to Hopetoun House to perform a Wedding Beat Retreat. On the 14th, we were playing in -12 degrees and on the 19th we played in shirt sleeves at midnight in +14 degrees – a fair contrast! As we now break for the Festive period, we’d like to wish all band members, friends and followers across the World a very Merry Christmas and a prosperous and healthy New Year! Monday the 14th December saw three lucky band members accompanied the When You Wish Upon A Star charity flight to Lapland which took 70 seriously ill children and their families on an 18hr trip of a lifetime to meet Santa on the edge of the Arctic Circle. Leaving at 2am they travelled to Prestwick Airport to play the families onto the chartered flight before flying to Rovaniemi in Finland in time to catch the three hours of daylight, accompanying them to the Enchanted Forest for some outdoor fun. Afterwards they were taken into the centre of the city for a meal and to meet Santa Claus himself, playing him and a very placid Rudolph into the hotel before travelling to Santa’s Post Office on the edge of the Arctic Circle. 20 hours later they arrived back at Prestwick having playing in minus 12 degree conditions but very grateful for this excellent opportunity to be part of this special trip. The band Christmas Party was held on Saturday 12th December with over 70 members and guests joining us into the wee small hours at Mother’s Gin bar on Howe Street. Many thanks to everyone who came along. And to clear the heads the following morning, we took part in the annual Wish Upon A Star charity Santa Stroll in Princes St Gardens before leading the parade up to the Grassmarket. On Saturday 5th December, whilst our antipodean band members and friends basked in a 33 degree heatwave at the Daylesford Gathering, we, in stark contrast, led our very own Stockbridge Santa parade in gaelforce winds and heavy rains through Stockbridge into Inverleith Park. On the 27th of November our G3 band performed at the Scottish Car of the Year awards at the Dalmahoy Hotel, then on the 28th we led the 5,000 strong Climate Change March from the Meadows to the Ross Bandstand in Princes St Gardens in very cold and blustery conditions – penance, we suspect, for the night before! After a well-earned break, the band resumed Practices in late October. Prior to this, and after a brief hiatus, the annual Stockbridge Pipe Band Golf Challenge Tournament was revived at Silveknowes Golf Course on Sunday 13th September. As is customary, the pipers took on the drummers and despite the drummers pulling in some guest players (cheers Scott Walsh and Graham Wilson) the pipers executed a clear win to retain the trophy. Many thanks to the Blackwolf Brewery for supporting the event! At the end of September, 20 band members returned to Mexico, eight years after we first travelled there, to perform at the Festival Santa Lucía, in Monterrey. The band were there at the invitation of Arturo H. Cueto and enjoyed an excellent trip. A full trip diary and photo gallery will be added soon. The band had a good day out at the penultimate competition of the Season held at Peebles. After competing before lunchtime, the G4 band then travelled to Harburn House in West Lothian to perform a wedding Beat Retreat. And when the results were announced it was a welcome pleasure to hear the band placed 3rd on a piping preference. The G3 band held their own too, placing 3rd in G3 and 2nd in G2. A slightly smaller band then undertook the post-competition parade through the town but still managed to enjoy a few beers at the normal finish line. The following weekend we were pleased to be asked to help the Lord Provost open the Ingliston Revival show. The G3 band undertook the task of playing the Lord Provost around the newly constituted track to open the 50th anniversary revival. Whilst this was ongoing, the G4 band travelled south for the final competition of the Season at Innerleithen. Heavy rain prevailed in the morning so the competition was sensibly moved indoor, allowing the G4 band to put on a decent performance helping them to place 4th in G4 as well as best drum corps in the G4 MSR. The G3 band then followed them down from Ingliston and, moving outdoors as the rain eased off, placed 1st in G3 and G2, with accompanying drumming prizes. And the G3 band then retained the Branch Champion of Champions for band and drumming for the 5th consecutive year. And last but not least, our Drum Major placed 1st in the adult heat. With a good end to the Season it’s time to bid farewell to Jimmy Smith who returns to Melbourne after competing with us for the past 6 weeks, Seoras Lewis who moves to Glasgow to begin studying at the Royal Conservatoire, Kenneth McBeath who moves to Aberdeen and Andrew Leslie who’s off to Australia for a year’s study sabbatical. The band are now preparing for our trip to Mexico on a fortnight’s time! August rolled round quickly, and with the cancellation of the competition at Melrose, the band travelled instead to Bridge Of Allan to compete. A woefully wet and miserable day produced woefully poor performances from both bands with neither featuring in the prizelist! Things did improve slightly the following weekend, as after a hard week’s practice, we headed along the road to North Berwick. Always a good competition, with plenty of overseas band freshly arrived and keen to settle in prior to the Worlds, it was a good day out with both bands playing well. Despite our efforts though, and due to the high calibre of the competition, silverware was not ours for the taking. World’s weekend arrived, with quite a few of the band taking time on the Friday to listen to the G1 qualifiers. Saturday donned rather cold and early for us with the G4 band on first in their heat. A decent warm up preceded an unsettled performance and it was with little surprise that there was no qualification forthcoming. The G3 band enjoyed a much more settled warm up compared to previous year, and whilst playing their MSR well, didn’t impress the judges sufficiently to warrant qualification. Luckily, with the whole site licensed this year, both bands were able to forget their disappointment and enjoy the higher grade performances. Our final competition of the month was at the Ingliston showground near Edinburgh airport. Whilst the G4 band faired less favourably in their competition, the G3 band won the G3 event and placed 3rd in G2. After our customary 2-week, mid-Season break to recharge the batteries, the band was back in action at Hopetoun House for a Beat Retreat. And we were delighted to welcome back Jimmy Smith from Melbourne who competed with the band last Season and who had returned to play with the G3 band for the latter half of the summer. Also joining us again was Sebastian Gotz from Switzerland who arrived in advance of the next big competition. The following weekend we travelled once more to Dumbarton to compete at the Scottish Pipe Band Championships. Expectations were high for the G4 to repeat their performance success from the month previous and, with confident ease, they qualified but this time just missed out on a prize in 7th place. The G3 band were able to play their medley for the first time this Season and were very happy with a 10th place out of 18 bands. And to round the day off, the band returned to Hopetoun House that evening for another Beat Retreat performance. 2015 is the band’s 20th Anniversary year and to mark the occasion, the band organised, hosted and performed at a 20th Concert in the St Stephen’s Centre at the beginning of June. A massive Thank You to everyone who helped set up, performed at, and came along to this event. Over 300 guests enjoyed some excellent entertainment from smallpipe and fiddle duo, Finn Moore and Sarah Hoy, a Quartet from the 10-times G1 World Champions Field Marshal Montgomery pipe band led by Pipe Sergeant Alastair Dunn, the brilliant 5-piece jazz/folk ensemble DOSCA from the Royal Conservatoire in Glasgow, and the Fiona Matheson and Dunbar Highland Dancers. The local Davidson’s Mains & District welcomed the guests and both our Stockbridge Pipe Bands performed too. BBC Radio Scotland’s Pipeline presenter, Dr Gary West was our compere for the evening and Hugh McDiarmid’s Haircut provided the music for the after-concert ceilidh. The music started just after 7:30pm and the festivities ended just after 1am with an afterparty in the St Vincent’s bar. Many thanks to R G Hardie & Co Ltd, Nicolson Kiltmakers and Apex Hotels for their generous support. And many thanks also to RBS and Scotmid who both provided generous Grants to assist with the costs of hiring the venue, PA, mixing desk and sound system, lighting, furniture, advertising and artists. Without their assistance the whole event would not have been possible. The following weekend it was back to normality with the G4 band leading the annual Kirkliston gala parade and the G3 band undertaking a corporate Beat Retreat at Hopetoun House. On the Sunday of that weekend, and in preparation for the next Major Championships, the band travelled north to Strathmore Highland Games held at Glamis Castle. It was a lovely day in great surroundings and invaluable to get both bands out competing again before heading to Forres at the end of the month. Just prior to heading north to Forres, the band held its annual fundraising Pipebandathon on the 21st June. Performing for 6 solid hours on the Mound Precinct outside the National Galleries of Scotland, we entertained the crowds with a mix of solo piping, small pipe duets, mini and full band performances augmented with some backing musicians to help raise money towards the cost of travelling to the European Championships. In advance of this competition, we were very pleased to welcome James Meiklejohn who currently studies in Cambridge but is from Edinburgh and Robert Mitchelmore, Lead Drummer with ESM college pipe band who both joined the G3 band. Also joining us from Switzerland was Sebastian Gotz who competed with the band last Season. The trip to Forres is always enjoyable and again we extended our time in the Highlands to include an overnight stay in Aviemore on the Friday and Saturday nights. After some additional practice on the Friday evening, it was early to bed and early to rise, leaving Aviemore at 8am. The G4 band were drawn to compete first in their qualifier at 10am and in beautifully warm conditions the band did an excellent job of qualifying. G3 then took to the grass and, despite a very promising warm up, it all changed in the circle and we delivered a very disappointing performance. G4 however, held their nerve to win 6th place in their Final! A mixture of elation and frustration prevailed as we meandered back to our hotel but once the band hit the high street it was merriment all the way until sunrise. To aid the recovery of the more fragile we stopped off en-route at Dunkeld for a pint and a few tunes at the Taybank Hotel, formerly owned by Dougie McLean and a local session hotspot. The busy month of May kicked off with the band leading the May Day parade from the Meadows, down the Royal Mile and on to the Pleasance. We had a large turn out and it was good to get the band, and some of our new winter recruits, out playing before the first competition. A fortnight later saw the band at the first local competition of the Season in Dunbar. Unusually, it wasn’t howling a gale and we were able to enjoy our first competitive outing in shirt sleeves. Our G4 band did exceptionally well, fielding a 17-strong pipe corps and placed 3rd overall out of 15 bands. And then they played up to G4A with their new MSR and placed 2nd out of 5 bands. We reckon it was the new bass drum sponsor’s logo which did it – the Black Wolf Brewery have kindly supported the G4 band for the 2015 Season and the sight of their fearsome wolf logo must have given us the edge. But whilst it was a good day out for G4 all round, our G3 band faired less favourably, placing 4th in G3 out of 5 bands. The next day, a mini band undertook a performance for a private party in Edinburgh. The performance was donated by the band earlier in the year for a Water-aid Charity Auction and the lucky winners enjoyed a mini Beat Retreat performance on the outskirts of Edinburgh. The following weekend, we were delighted to perform a Beat Retreat for a large tourist group at Edinburgh Castle. Despite it being our nearest venue, most bands booked for events at the Castle are usually required to wear full Number One Dress so it was a welcome pleasure to find ourselves up in the castle on a fine spring evening to entertain the crowds. On the 26th May, we travelled the short distance to the British Championships, held at a new venue for the final year in Bathgate. Logistical issues of access and orientation aside, this venue was much larger and well laid out compared to the previous years but this did little to assist our prize-winning capabilities! Both band’s performed averagely with no silverware in sight. And earlier in the month, we held the official launch of our Limited Edition 20th Anniversary Craft Beer. Our G4 sponsors, the Black Wolf Brewery have crafted a unique beer to celebrate the event and, with some creative marketing and good old-fashioned sales pitches, a number of local bars have taken 2-3 kegs of beer. Every pint sold generates a donation towards band funds so a massive thank you from everyone in the band to both Black Wolf Brewery and our local pubs for supporting our Anniversary! Participating bars are: Kays Bar, Clarks Bar, The Antiquary, The Bon Vivant, The Raeburn Bar, The Cambridge Bar, The Cumberland Bar, Milne’s Bar, The Bailie, The Scran & Scallie, St Vincent, Sandy Bells, The Royal Oak and the Athletic Arms. The past two months have seen both bands working hard on new competition and performance material for the 2015 Season as well as undertaking a number of engagements. In February we were involved in the pre-match entertainment on the Murrayfield Mile for the Wales and Italy fixtures, playing to the masses as they headed for the stadium from the city centre. In March, we held our annual fundraising ceilidh on the 21st at our usual venue, the Teviot Debating Hall on Bristo Square. Over 200 guests joined us for some excellent music provided by our stalwart ceilidh partners, the Pentlands Ceilidh Band who were to be found the following Saturday on BBC Scotland’s Take The Floor programme. Both bands performed for friends, family and guests and the party went on well into the wee small hours! The following week we had our first competition of the Season with the Lothian Borders Branch indoor competition in Livingston. A change for 2015 was the format for the competition which moved from a mini-band to a full band event. Our G4 band played well but placed last whilst the newly graded Davidson’s Mains and District youngsters took a well-deserved 1st place. Grade 3 only had two entries – many thanks to Wallacestone and District who came across for the day and won the event. A plus side was the inclusion of a full compliment of judges for the competition which certainly presented very constructive feedback. And congratulations to one of our novices Eimhir Watters-McKechnie who placed 4th in her chanter class. We’re delighted to welcome a few more new faces to the band; Guy Stevenson and Tom Leitchman join our G4 corps, Tom returning from 18 years in Australia and most recently playing with the City of Cockburn pipe band. James Meilklejohn joins our G3 band after graduating from George Heriots and although he now studies in Cambridge he is doing some distance learning in preparation for the summer season back in Edinburgh. After a brief break over Christmas and New Year, the band resumed twice weekly practices. Our first engagement of 2015 was a local one – performing at the late night opening of the new Urban Village Hotel at Crewe Toll. As is customary for this time of year we say goodbye to a few band members and welcome new ones who join the band. After two Seasons with us we bid farewell to Charley, Michaela and Paul Rafferty and wish Charley all the best with her new band, Preston Lodge High School, as they start afresh after their promotion to the Juvenile grade. We also say goodbye to Bruce Clark, Bobby Ross, Lewis Will and Karen Ferrier who all leave due to work and other commitments. We are very pleased to welcome pipers Melissa Millington and Becky Wrightson from the US who join our G4 band whilst studying in Edinburgh, Amanda Campbell, Andrew Richardson, Andrew Leslie, Tommy McLellan and Michelle Lord who all join our G4 band as well as Kaitlin Bogle, Alec McLatchie, Sandra Wenk and Daniel Wenk who all join our G4 drumcorps. Welcome also to pipers Seoras Lewis, Patricia Rhur, John Gifford and Jim Cooper who join our G3 band and to Colin Winter who returns to the corps, and also David Butler, Lee Kid and Claire Hamilton who join our G3 drum corps. We still have scope for new competing players so feel free to get in touch. We’ve also seen a surge in learners over the winter with a healthy crop of beginners and novices joining our Thursday teaching nights – we can give tuition in piping, snare, bass and tenor drumming and are happy to assist players wishing to get back into the band scene after a break. More details about practices can be found on our website. December proved to be a busy month for the band – our first engagement saw us performing for corporate clients at the Mansfield Traquair, a beautiful converted church venue in Edinburgh. On Saturday 13th December about 50 band members and friends attended the band’s Christmas Party at Lulu’s on George Street before heading to Tigerlilly’s near Charlotte Square for dinner. Danish TV joined us to film at one of our practices for a primetime DR1 show which involved the show’s host undertaking a brief lesson in how to play the bagpipes from Greig Canning before having a chance to perform with the band! All good fun and lighthearted, we were able to keep one step ahead with our own Danish piper Janne Hansen who gave the host an insight into what a Scottish pipe band is all about! On the same day, three band members were very fortunate to be asked again to accompany this year’s When You Wish Upon A Star trip from Scotland to Lapland. The national charity organises many events annually for seriously ill children, one of which is this trip of a lifetime to the Arctic Circle in Lapland to enjoy some enchanted festive fun and to meet Santa himself. Once again we were delighted to be part of this amazing event adding a bit of pomp and ceremony to proceedings which included piping for the arrival of Santa and Rudolph! The day before we took part in our 9th When You Wish Upon A Star Santa Stroll in Princes St Gardens which helps raise funds for this, and other outstanding work this charity does Saturday the 20th December kept us busy with a full band performing at a wedding Beat Retreat at Oxenfoord Castle as well as a mini-band playing for guests at the Lord Provost’s Christmas Reception at the City Chambers. And then our final engagement for 2014 was a guest appearance onstage with the Scottish Fiddle Orchestra at the Usher Hall on the 30th December for their annual Hogmanay show. This was our first appearance with the SFO and also at the Usher Hall and the band did a sterling job. complimenting the excellent SFO for several sets under the compare of the inimitable TV gardener and broadcaster, Jim McColl MBE who applied his own unique blend of humour and anecdotes to the evening. The band enjoyed a good break across September and October before resuming practices to start learning the new material for the 2015 Season. We’ve also been super busy on the engagement front with various corporate Beat Retreats at Dundas Castle and Hopetoun House as well as performing on the Murrayfield Mile in advance of the autumn Rugby fixtures. We were also please to perform at Meadowbank Stadium for the 6th Commonwealth Taekwondo Championships at the beginning of November and we finished off the month performing in St Andrew’s Square as part of the St Andrew’s Day celebrations. The bands enjoyed an excellent day out at Peebles Highland Games on Saturday with G3 placing 3rd in G3 and 4th in G2. The prizes were most welcome but it was also time to say goodbye to some more of our guest players; Kelly Henderson returns to Pittsburgh and the Carnegie Mellon University pipe band under PM Andrew Carlisle, Megan Griggs and her family return to North Carolina and Jimmy Smith ventures back Down Under to begin the lead up to their summer Season with the recently reformed City of Whitehorse Pipe Band. We wish them all a safe journey and look forward to seeing them again soon. The 2014 Season drew to an end at the Innerleithen Pipe Band Championships. Our G4 band placed a healthy 2nd place, winning the drumming prize as well, our G3 band won G3 for band, drumming and bass section, placed 2nd in G2 and won the drumming in G2. And as this was the final competition of the year, the G3 band also won Branch Champions as a band and drum corps. Not a bad haul for a day’s work and the weather was excellent too! Many thanks to all our band members for their continued dedication and hard work, as well as our loyal helpers and supporters without which we wouldn’t be half the band we are. August kicked off with the local Melrose competition, brought forward a few weeks this year. Persistent drizzle prevailed all day with many bands not showing up but we persevered and were happy to place 3rd in G4, 3rd in G3 and 2nd in G2. The following weekend the band attended a much sunnier North Berwick with an excellent number of local and overseas bands competing. With big heats all round, G4 placed 9th in their heat of 16, G3 placed 6th in their heat of 9 bands and then 11th out of heat of 13 G2 bands. The World’s Week drew to a close with the two-day event held over the 15th and 16th August. Saturday was pretty challenging with torrential rain, cold conditions and then occasional sunshine too! Congratulations to Keith, Rory and the Grade 4B crew who placed 3rd in their qualifying heat in the morning to earn them a place in the final. They played exceptionally well first time round but the realisation of the final took its toll and the band placed 17th overall. And well done to the G3A drummers on a 3rd place in their qualifier too. Unfortunately the G3 battled through the rain to tune up which didn’t help their efforts to qualify and although they produced a credible performance, they finished up 8th in their heat of 14 bands. It’s now time to bid farewell to David Boyle, Jessica Mueller, and Sebastian Götz who return home to Australia and Switzerland. It’s been great having you guys over and we hope to see you again soon. And now we welcome Teale Failla and Kelly Henderson who join us for a few days from the USA. Both bands had a successful day out at the Edinburgh Pipe Band Championships on the 23rd of August, winning Grade 4, Grade 3 (and best drums) and placing 3rd in Grade 2. Congratulations to everyone who competed and the G4 band in particular on their first win! After a two-week break the band were back in action at the Edinburgh Jazz and Blues Festival Cavalcade, parading from The Mound, along Princes St and into Princes St Gardens West on Sunday 20th July. Loads of local and international musicians performing with a hugely vibrant vibe made this a very enjoyable local engagement. Next up we were back at Dumbarton for the Scottish Pipe Band Championships on Saturday 27th June. Whilst neither band felt they had played particularly poorly, competition was stiff with our G4 band finishing last and our G3 band placing 11th. Our sprits perked up again for a wedding engagement later that week in St Andrews. A Welsh-Scottish marriage it was the first time the band had ever had the entire reception flash mob the dance floor where we were performing! The busy month of June was soon upon us with our first outing to the Bathgate Procession on the 7th. Featuring a plethora of pipe bands this was a massive event and which was very well attended. The following weekend we were back in West Lothian for the Kirkliston Gala Parade followed by a corporate Beat Retreat at Archerfield House, East Lothian on Monday 16th June. On Saturday 21st the band travelled to Peebles to perform a Beat Retreat at town’s unique evening Beltane event. Joining forces with the Central Band of the Royal British Legion we performed a 45 minute event on the High Street to an enthusiastic audience of about 2000 people. The following day, we set up camp on the Mound Precinct for our annual fundraising Pipebandathon. Six hours of non-stop music followed with a blend of solo pipers, mini-bands, pipes and fiddle ensembles, smallpipes, drum fanfares, highland dancers and full band performances culminating in the band raising almost £1000 during the day from generous tourists. Many thanks to everyone who helped, participated and donated. Finally, we travelled north to Forres to compete at the European Championships on the 28 June. We left for Aviemore on the 27th and enjoyed a good meal together before an evening practice. The after breakfast we set off for Forres which was particularly wet and overcast. G4 had a decent run but the wet weather did little to assist them. The G3 band played a lot later in the day and enjoyed good sunshine and a perfect run through tune-up, only to deliver a very poor overall performance which saw the band finish outside the prizes. We did still manage to enjoy ourselves though in Aviemore, sampling the nightlife and hotel facilities before returning to Edinburgh the following day. Our first outing of the month was leading the May Day parade down the Royal Mile from The Hub to The Pleasance. A full band enjoyed the brief march through the historic centre. The month of May saw the start of the competition Season at Dunbar on the 17th. Typically renowned for inclement weather, this year’s competition was pleasantly warm with good conditions for all bands competing. The youngsters of Davidson’s Mains and District got off to a cracking start with a 4th place, our G4 band placed 7th and our G3 band placed 6th out of 12 bands and 7th out of 13 bands in the Grade 3 and Grade 4 competitions. Two weeks later we travelled north to Dunfermline for the first competition to be held at Pitreavie Park in almost 20 years. It’s a great location for a competition and the attendance of the G1 Shotts and Scottish Power pipe bands made for a good day’s entertainment. Both of our bands played well with our G3 band earning a 4th place. Congratulation to our Drum Major who also picked up a 4th place prize. The final weekend was reserved for the British Championships at Bathgate. Again, a good sunny day, our G4 band missed out on qualifying for their final, albeit the drummers did manage a top 6 place! And our G3 band placed 8th overall in their first outing in G3A with a 5th for piping. A good start so far! April was a quiet month, with the only event being the annual Ceilidh Culture Street Party on Sunday 20th. At the eleventh hour the Party was relocated to the Grassmarket which provided a much more pleasant location for the marquee than Castle Street. The area was also loaded with tourists so the band had the pleasure of playing to some excellent crowds on our fist outdoor performance of the year. The band enjoyed a busy start to the year with a number of engagements throughout the month of March. We returned to Hopetoun House for a Wedding Beat Retreat on the first day of the month. The following week we fielded one mini-band for a performance on the Murrayfield Mile whilst a second performed on The Mound as part of the Scotland vs France 6 Nations pre-match entertainment. The French crowds were in excellent form, turning the city centre into a sea of Red, White and Blue and we enjoyed some good-natured rivalry and a few ‘play-offs’ with them as we performed. Our annual fundraising Ceilidh was held once again at the Teviot Debating Hall on Bristo Square. The Pentlands Ceilidh band entertained almost 300 guests with performances from both our G4 band (a first-time outing under new PM Keith Westhead) and our G3 band. Many thanks to everyone who came along in support of our band. The following Friday saw two pipers assist the Sainsburys South Bridge Store with their Sport Relief Fundraiser at the Meadows on a cold and crisp morning, whilst in the evening a full band dodged the rain and played in near sub-zero temperatures for a Beat Retreat at the Sheraton Hotel on Festival Square. Finally, a mini-band entertained guests at the Maggie’s Centre fundraiser event held at the Ghilli Dhu on Rutland Square and organised by the students of Queen Margaret’s University. The final weekend of the month marked an early start for the 2014 competition Season with the Lothian & Borders branch indoor solo and mini-band competition being held on again in Livingston. Well done to the band members who took part in solo competition and congratulations to Eimhir MacKechnie who placed 4th in the 10 years and under solo chanter. Well done to the youngsters of Davidson’s Mains & District who, still as newbies in this grade, nudged further up the prize list, placing 11th and 14th out of 17 bands in the Novice Juvenile contest. Our G4 band placed 6th and 7th out of 9 bands in a mixed 4B and 4A competition, with only G4A bands above them and our G3 band placed 2nd and 4th out of a small 4 band competition. Most importantly, well done to all our new members, both first timers and seasoned pros, on their first competition with the band. It’s a nerve racking experience playing in a mini-band; much more so than when playing in the full band and now this competition is over we will settle down to working on the judge’s feedback in preparation for the summer competitions. The band resumed practices at the beginning of a new year and got straight back into preparations for the coming Season. We are still looking for new members, especially mid-section members for our G4 band. Anyone interested in learning, playing or competing with us please email us or view our Tuition and Joining web pages for more information. Whilst the band weren’t involved in any Burn Supper celebrations directly this year, many of our members were involved in various events over the weekend. From early morning presentations and playground ceilidhs at local schools, to quartet performances at a local superstore and pipers playing at the Danish Scottish Society Burns Supper, we made sure the Bard’s Birthday wasn’t forgotten. And on Sunday 26th January, several band members enjoyed an afternoon Session at our G4 PM’s house, dusting off smallpipes, guitars, bouzoukis, banjos and fiddles and enjoying a break from the band repertoire to try out some common Session tunes. After a couple of good trips abroad and a few weeks break, the band resumed practices at the beginning of November. Immediately we were out performing again, this time at the Edinburgh Has Talent show, held on Friday 1st November at the Festival Theatre. The band helped open the show prior to the ten finalists competing for the annual title before moving to the very top of the auditorium to pipe the competitors and judges back onstage for the winner’s announcement. There then followed several weeks of practice, beginning the build-up to the 2014 Season. With new MAP 2/4s and MSR for the G4 band and new performance tunes for the G3 band there’s been plenty for everyone to get their teeth into. And we’ve even managed a couple of outings as well; on the 5th December a Trio welcomed several hundred guests to the Scottish Green Energy Awards dinner at the Museum of Scotland, on the 8th December a band of over 30 players performed at the annual Wish Upon A Star Charity Santa Stroll in Princes St Gardens and on the 13th December a miniband welcomed the 150 guests to the Lord Provost’s Christmas Reception at the City Chambers. The band Christmas Party was held once again at Lulu’s on George Street where about 70 band members, friends, family and guests enjoyed food and drink as well as videos and slide shows of the past Season’s highlights. Awards and presentations also took place with a special presentation to retiring band Treasurer Cameron Tulloch who handed over the reins after 10 years of service. And our annual ‘Most Improved’ awards went to pipers Mark Love (G4) and Keith Westhead (G3) and drummers Rory Marshall (G4) and Kathryn Wylie (G3). Congratulations to them all. We say farewell to Freya Clenshaw and Sebastian Mitchell who both leave our G4 band and bid a fond adieu to Fiona Boyle who leaves us after two years to return to Melbourne. We’re sure we’ll see her again soon though! We are delighted to welcome pipers Angus Nicoll from Carnoustie, Duncan Tait from Dollar Academy, Stewart Paterson from the City of Edinburgh and Eden Turner from Craigmount pipe band into our G3 corps as well as new pipers Martin Duncan, Don Uttley, Danny Balfour, Aohngus MacKechnie, Kenneth MacBeath and Lachlan Johnston into our G4 corps. And welcome also to Jessica Webster, Lorna McLachlan, Torin Currie and Alison Buck who join our G3 drum corps and Craig Arundel, Aria Buck and Catriona Duncan who join our G4 drum corps. The band is now enjoying a break for the Seasonal Festivities – Merry Christmas to all our friends, followers and supporters! With the final Branch competition at Peebles cancelled this year Cowal brought our 2013 Season to a close. With this comes the departure of our G4 PM Kate Spowart who heads to Australia for a year to soak up the culture, sights and sounds of this vast continent. We wish Kate all the best for what adventures lie ahead and look forward to seeing her back at some point in the future. To ensure a smooth transfer of leadership for the G4 band we are pleased to appoint G3 piper Keith Westhead as the new G4 Pipe Major. Keith takes over with immediate effect and we wish him every success with his new role. We have spent the past month selecting new material for the 2014 competition Season with a view to getting an early start on learning the tunes and strengthening the band in readiness for the first competition. At the same time, the band has undertaken not one, but two trips abroad. Our first trip was to appear at the Tattoo Festival Des Musiques Militaires, in Ville Le Grand, France on the 21st and 22nd September. This was a military-style event held in a rural commune located in the Rhône-Alpes region of France which focused around two lengthy Tattoo shows as well as a number of small parades and performances. And then the band travelled to Luzern, Switzerland two weeks later to perform at the World Band Festival, Tattoo on Stage, held in the impressive KKL Concert hall on the shores of Lake Luzern. This was a stage show performance which included three sell out shows and culminated in the band taking a late night lake cruise on a rather impressive power yacht! Full trip diaries and photo galleries will be added soon. And, further to the success of the G3B band during the 2013 competition Season, the RSPBA have promoted the band to G3A for the 2014 competition Season! A huge Well Done to everybody in the band! It’s been a great Season with the band winning 23 trophies and two Major Championships. The band members have applied a great deal of effort and commitment over the past few months, and with the invaluable assistance of our tutors, Scott Walsh and Matt Wilson, we are delighted with this outcome. The band is now on a well-earned break with practices resuming at the end of the month. 2013 Cowal Champions, Drum Corps and Band!!! 2013 G3B Champion of Champions, Drum Corps and Band!!! Travelling to the final competition of the Season our G3 band knew they would have to deliver an excellent performance if they wanted to retain a place at the top of the Championship Table. With the New Ross, the Vale of Atholl, Milngavie and Wallacestone pipe bands all sitting above us in the Championship Table, our aim was to get as close to the leader bands as possible. However, due to the band producing one of our best medley performances of the summer which saw us place 2nd for piping, 1st for drumming and 2nd for ensemble, we were delighted to win both the Drum Corp and Band prizes! However, it didn’t end there. Our win, combined with the overall placings of the other bands at the top of the table resulted in a three-way tie for the Championship. And due to our two wins at the Europeans and now Cowal, we were crowned 2013 G3B Champion of Champions!! A massive congratulations to everyone for an excellent result and an amazing end to a fantastic Season. Our G4B band also produced the best result of the Season with on an 8th place in the qualifier and the young drummers placing a very credible 5th. Needless to say it was a very jolly bunch of fancy dress pirates who enjoyed the last Cowal Street Parade and partied hard all the way back to Edinburgh. There’s no rest ahead though as we prepare now for two trips abroad – to Villa La Grand in France and Luzern in Switzerland. The busiest competition month of the year began North Berwick highland games on Saturday 10th August. Congratulations to our G4 band on their 4th place in the Confined Branch competition. The band had a decent run but it was, as always, a large field and competition was stiff. Our G3 band enjoyed a good run, placing 3rd in the Open competition and 2nd in the Confined. Next it was the much discussed two-day World Pipe Band Championships, held as ever on Glasgow Green on the 17th and 18th August. Our G3B band were first up on Saturday and endured torrential rain and a blustering winds as they battled through the morning Qualifier, finishing 4th and securing a place in the Final. Thankfully the weather settled down after lunch and the band enjoyed a much better tune up and produced a decent performance for the Final. Placing 9th and 4th for piping and 3rd for drumming, a disappointing 11th for ensemble saw them draw 6th equal and lose the place to Toronto Police’s G3 band. Many thanks to our two drone tuners from Portlethen and District, also G3B, who helped us tune up for the final before disappearing off into the ether – very much appreciated guys! Back on Glasgow Green on Sunday morning and it was our G4B band’s turn, playing in a 21-band Qualifier. Despite one of the strongest performances of the Season from the band they were placed 17th and 18th. For our young ‘back line’ this was their first Worlds and they did an excellent job but the band were clearly disappointed with the outcome. Finally, the really young stars of Davidson’s Mains and District competed in their Novice Juvenile Qualifying Heat. The band enjoyed a good warm up until the heavens opened up a few minutes before they were due to compete and tipped a ferocious downpour upon them. Undeterred they dried themselves off and produced a solid run in this, their second World Championships to finish 11th equal out of 15 bands. Congratulations and commiserations also to another Edinburgh NJ band, Erskine Stewart Melville Schools, who also qualified and then finished 6th equal in their final! So, two very demanding and intense days of competition with Field Marshal Montgomery taking the top prize in G1. But will this format prevail or will the RSPBA return to the one-day event? Next is was the Edinburgh Pipe Band Championships, held at Ingliston showground on the Saturday 24th. Congratulations to the youngsters of Davidson’s Mains & District Pipe Band who had a very solid performance and won 4th Place in their Grade. Our G3 band won 2nd Place in G3 and 1st Place in G2 as well as 2013 G3 Branch Champion of Champions for drumming. After a two week break the band started back into the third week in July with two practices and also two Beat Retreats – playing at Archerfield House for guests of The Open Championship which was being held next door at Muirfield Links Golf Course. The heat wave was still with us and the band enjoyed two balmy nights playing on the lawn of Archerfield House as various guests came and went by Limo and Helicopter. Thankfully, the pipe band competition at Melrose was reinstated this year on Saturday 20th July with a return to it’s former venue at St Mary’s school grounds. Only the G3 band were in attendance placing 2nd in G3 MSR competition and 3rd in G2 Medley competition. The final weekend saw bands converging on Levengrove Park, Dumbarton for the Scottish Championships. It was an early start from Edinburgh to get over in time for our G4 band to compete in their heat. Despite a very solid performance which was rewarded by a 3rd place from one judge, the band didn’t qualify for the final. Our G3 band delivered a fair MSR performance – tonally unstable and technically not as clean as we can play – and were certainly disappointed with their 5th place overall. However, that’s three places out of three Championships. The biggest challenge to come is in three week’s time at the World Championships on Glasgow Green and we will need to work hard over the intervening weeks if we intend to make it four out of four. And we extend a warm welcome to David Boyle from Melbourne, who joins us for a few weeks whilst holidaying in Edinburgh. A huge Congratulations to the G3 band who lifted both the drumming and band prize at the European Championships held at Grant Park, Forres on the 28th June. The band travelled up on Friday and stayed over in Aviemore before setting off for Forres on Saturday morning. Our G4 band had probably the best run of the Season so far but failed to qualify in their heat. The G3 band enjoyed a relaxed tune-up before putting on a pretty solid performance to lift the title. This was a new venue for the European Championships and it certainly delivered all it had promised. The Sunday before the band held it’s first ever sponsored Pipe-Band-A-Thon on the Mound Precinct. Starting at 10am, a mixture of band, duet and solo performances kept the music going continuously for 6hrs through torrential rain and sunny spells to help raise an excellent four-figure sum for band funds. Many thanks to everyone who played and supported us with particular thanks to our event supporters; Scotmid, James McCaig Farms, Totem Signs, IDES and Balfour & Mason Solicitors. On the 18th June, the band competed at the local Innerleithen competition with the G4 band playing well to place 3rd and the G3 band placing 4th in both G3 and G2. The band also undertook a number of Beat Retreats at venues across and around Edinburgh. We bid farewell to piper Karen Smith and tenor drummer Joelle Rafle who both leave our G3 band and welcome back Blair Milne who rejoins us from the ranks of Grampian Police whilst they continue to re-build for 2014. Rachel Curry also joins the G3 mid section and Murdo Marshall and Michael Twamley also join our G4 mid section. Now, it’s time for a two week break and then it’s back to the grindstone in preparation for the Scottish Championships at Dumbarton in July. April was a quiet month with no band engagements – just lots of hard practice! We did receive a visit from members of the Border & District pipe band from Aabenraa, Denmark who stopped in to a practice. The 6 pipers from this fairly new non-competing Danish band were visiting Edinburgh to get measured up for new kilts and after watching our Thursday practice joined us for a pint afterwards. Otherwise it was continued hard graft with the odd outdoor Saturday practice thrown in to help us acclimatise in preparation for the customary Scottish summer! May kicked off with the band leading the May Day Rally. Fielding 23 pipers and 10 drummers we led the parade from the top of the Royal Mile down to St Mary’s St and along to the Pleasance. And in a break from the norm it was so warm and sunny that we were able to undertake the parade in shirt sleeves – a first for us in Edinburgh! In stark contrast, the outdoor Season began with a windy, cold and wet competition at Dunbar on Saturday 11th May. The youngsters of Davidson’s Mains and District began the day’s competing and despite the miserable playing conditions did very well and managed a 4th place in piping. Well done to the G4 band under new PM Kate Spowart, and in particular our three young snare drummers, for presenting a solid performance from which to build upon over the coming weeks. The G3 band placed 4th overall whilst the drummers did a particularly good job and took 2nd place. The band then went straight to play for the Drum Majors. Then, frozen to the core and with no time for a warm up, the band also played up to G2 and managed to hold together a fair medley performance. Finally, well done to our G4 bass drummer Michael Binder on his first Drum Major competition and a 3rd place! The second competition of the Season was the West Lothian Highland Games at Meadow Park, Bathgate on Saturday 18th May. Whilst the G4 band missed the worst of the weather to put on a much improved performance from Dunbar the week previously, the G3 band had the pleasure of tuning up and competing through torrential rain. Asked again to play for the Drum Majors it was with some relief that we were informed the G2 and G1 competitions had been cancelled. With a waterlogged field and dwindling spectators it was a sensible decision which saw the results for the NJ, G4, J and G3 competition announced under canvas. G3 put on a better performance that the week before and placed 3rd overall with the drummers again placing 2nd. Here’s hoping that the park dries out in time for the British Championships next weekend. 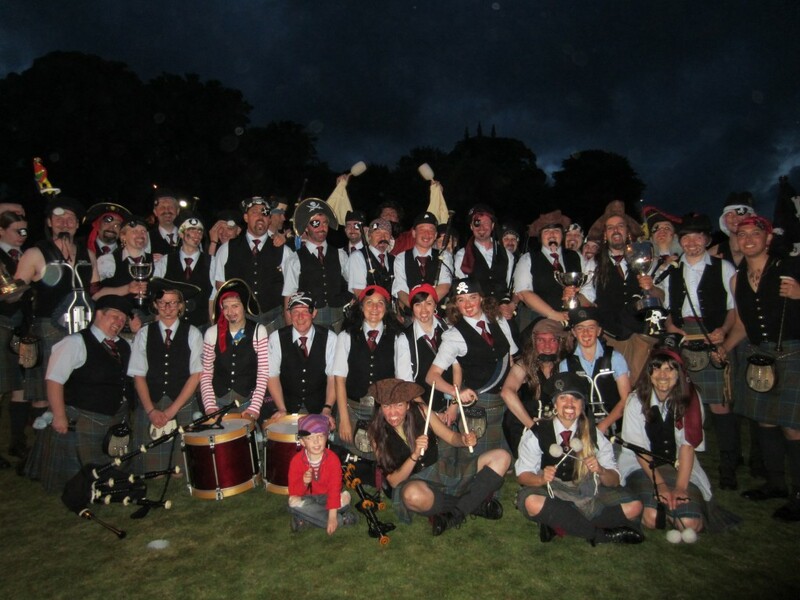 Stockbridge Pipe Band G3B Drum Corps – 2013 British Champions!!! Well at last the sun shone as the first Major of the Season took place on Saturday 25th May – the British Pipe Band Championships held at Meadow Park, Bathgate. In complete contrast to the washout the weekend before, the park dried up, the sun shone continually and 145 bands enjoyed an excellent day out. A massive Congratulations to our G3B Drum Corps, led by Andrew McCaig, who are the 2013 G3B British Champions!! And an equally huge well done to the G3B Band for placing 6th overall. Drawn first on in a heat of 16 bands, the band put on a solid performance, marred only by a few errors, to capture the first Championship placing in over a year! Our G4B band placed 9th in their qualifying heat, not quite making the top 6 but improving continually as each week goes by whilst the youngsters in the Davidson’s Mains & District pipe band also enjoyed a decent run out in only their 2nd Major competition. And well done to the organisers of this, the first of three British Championships to be held in Bathgate, on arranging an excellent event – we’re looking forward to 2014 already! Finally, after a quick clean of the shoes and repress of the kilt, the band were out on Sunday 26th performing an evening corporate Beat Retreat at the Mansfield Traquair, Edinburgh for some German guests. Many thanks to everyone who came along and supported the band at our fundraising ceilidh on Saturday 2nd March. The Pentlands Ceilidh band were once again excellent and kept the 240 strong attendees birling into the wee small hours. And many thanks also to the youngsters of the Davidson’s Mains & District pipe band for performing too – great to see this band developing and getting better each time we hear them! Hope to see you all back at our next one! The 2013 competition Season got underway with the Lothian & Borders Branch indoor solo and mini-band competition at the James Young High School, Livingston. Well done to to all those who made their competition debut and in particular our two young G4 drummers James and Rory. We entered two bands in each Grade with both highest placing bands coming 5th. Crit sheets were constructive and their is plenty of work to be getting on with before we hit the grass at Dunbar on May 11th! The band was also out performing, this time at the Ceilidh Culture Street Fair on a crisp, cold but sunny Easter Sunday. This high profile event platforms and promotes the very best of Scottish made crafts, fashion, jewellery, food and drinks and it was great to get outdoors with a good-sized band again. We bid farewell to Calum and Karen Reynolds who both joined the band for the 2012 Season – Calum also plays with the Edinburgh Academy pipe band which will now become his main focus. And we also say goodbye to Keith Milligan. Keith has been with us since 2005 and helped us win all our Major Championships as well as a host of other prizes along the way. A major part of our band during the past 7 years, Keith is now spending time with his local band, North Berwick and we look forward to seeing them out during the forthcoming Season. We are also pleased to welcome Paul, Michela and Charley Rafferty who join our G3 drum corps from the Pryde of East Lothian pipe band. February was a quiet month apart from one event. On Saturday 23rd February we performed Centre Band duties at the RBS 6 Nations Woman’s Scotland vs Ireland fixture at Lasswade. Snow, sleat and rain didn’t dampen our spirits but the Irish were a stronger team on the day, beating Scotland 30-3. After a brief break the band have been hard at work getting up to speed on the new competition material for the 2013 Season. Once again Scott Walsh and Matt Wilson will be helping us at intervals to ensure that we are on the right track. Stockbridge Pipe Band are delighted to confirm that we will be appearing at the World Band Festival Stage Tattoo at the KKL Luzern concert hall on the 5th and 6th October 2013. The Tattoo is part of a week-long world music event which will see the band performing three shows at the 2000 seat venue. This is the first time a Scottish pipe band has been invited to perform at this event and we are looking forward to both being part of this extravaganza and meeting up with some of our Swiss friends who we met earlier this year whilst in Avenches. Unfortunately, we bid farewell to our G3 Pipe Sergeant Rachel Grey who heads to Torphicen and Bathgate pipe band to join her elder brother Andrew. We wish her all the best in Grade One and look forward to seeing her out competing in the next few months. We’re pleased to confirm that former G4 Pipe Major Clare Miller has stepped back into the G3 PS role and that G3 piper Kate Spowart has taken up the reigns of the G4 leadership, with assistance from Mark Love and Peter Mueller as Pipe Sergeants. Pipe corps leadership reshuffles complete we’re still looking for any experienced players to join both bands in advance of the 2013 competition Season. We’re pleased to welcome back pipers Lewis Will from up north and newly-weds Marie and Bobby Ross who join us from the recently promoted Denny and Dunipace pipe band. Izzy Webster and Peter Sharp have moved up to the G3 band with Izzy relinquishing her role as PM of the Davidson’s Mains band. Clare Miller now heads up this Novice Juvenile band for the year ahead and we look forward to hearing them in action again soon. We’re also pleased to welcome back Calum Arundel from Newtongrange pipe band and extend a warm welcome to Andrew Johnston, formerly of Erskine Stewart Melville pipe band who both join the G3 drum corps. And we are very pleased to welcome Gordon Forbes to the G3 drum corps. Gordon has recently moved to Edinburgh and whilst work and his commitments to competing with Manawatu from New Zealand mean it is unlikely that he will compete with ourselves we welcome the wealth of experience and enthusiasm he brings to the band. Four pipers performed at Edinburgh Castle for the official Christmas E dinburgh launch on the 30th November. The pipers played the invited Press, Councillors and Dignitaries into the launch and were joined by Frosty, Rudolph and Father Christmas. The band played for the 7th year at the Santa Stroll in Princes St Gardens on Sunday 9th December. Hundreds of people took part in the Wish Upon A Star Charity event to raise money for sick and terminally ill children. On Monday 10th December a solo piper played for the unveiling of some public Art in Wester Hailes by the Lord Provost and on Friday 14th two pipers played guests into the Lord Provost’s Christmas Reception at the City Chambers. Also on Friday 14th, a mini-band performed at the Davidson’s Mains & District NJ pipe band’s Christmas Party held at the Royal High School. On Saturday 15th the band held its Christmas Party at Lulu’s, beneath Tiger Lilly on George Street. Band members, family and friends enjoyed drinks and dinner in the opulent surroundings of Edinburgh’s most lavish party venue whilst the more resilient band members partied out into the Grassmarket until the wee small hours. And finally on Monday 17th December four band members were privileged to be asked to accompany the Wish Upon A Star Charity charter flight of ill children from Prestwick to Lapland in Finland to perform throughout the day. More information about the trip can be found on our Festival page. Continuing our run of corporate mini-band events, we performed for another delegation of Swiss clients at the very well appointed Caledonia Waldorf Austoria hotel on the 1st October. October 13th saw a mini-band play for a Wedding Reception at Dundas Castle hotel on the outskirts of Edinburgh. We then performed Centre Band duties at the Scotland v’s Ireland and Scotland v’s England Knights rugby league fixtures on the 14th and 28th October respectively. Cold and wet conditions prevailed on both occasions but despite fielding large bands both times, we failed to stir the Scottish teams to a victory. Congratulations to band member Alexander Scott-Sime who placed first in the 16-18 years 2/4 March and second in the 16-18 Strathspey and Reel piping competitions at the Royal National Mod held in Dunoon recently. 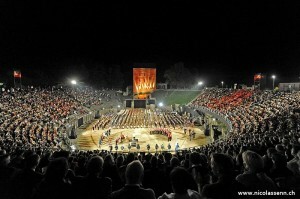 The Band is just back from performing at the Aventicum Musical Para de and Tattoo at Avenches, Switzerland. We had a fantastic time, a good few laughs and made some new friends as well! The Massed band Tattoo was organised as part of the Aventicum Musical Parade by the Pipe Band Association of Switzerland and we would like to thank both Thomas Muller and Peter Mueller for all their hard work and assistance in arranging our trip. Workshops were ongoing all week for the other Swiss band members who made up the 80-strong massed bands along with ourselves and these were taken by piping instructors Gordon Lawrie, Robert Mathieson, Ian McKerral, John Brown, David Bruce, David Caldwell, drumming instructor Steven McWhirter and Drum Major instructor Paula Braiden. We’d also like to express our thanks to these individuals as well for their encouragement, assistance and friendship during the trip. Photos and videos will be added in due course. The band played at a Beat Retreat at Archerfield House, East Lothian on the 12th October. A mini-band provided entertainment for 145 strong male dutch choir at the Holiday Inn Corstorphine on the 16th September – the choir sang O’ Flower of Scotland whilst we played which was a bit out of the ordinary but very enjoyable! And a mini-band entertained Swiss legal clients at the Royal Mile Radisson Blu hotel on the 28th September. Practices resume next week prior to a wedding Beat Retreat at Dundas Castle and then performing centre band duties at the Alitalia European Cup – Scotland v Ireland rugby match, Boroughmuir Meggatland, both next weekend. And we are pleased to announce that the G3 drum corps have won the Lothian and Borders Branch Champion of Champions title. Congratulations to Andrew McCaig and his Corps. As a band we drew 1st equal with Scottish Borders who were awarded the title based on the number of first places they had won this Season. Congratulations both to Scottish Borders on an excellent first Season in G3 and also to our own band as well for maintaining our position at the top of the table for the third consecutive year. North Berwick Highland Games was held on Saturday 4th August under changeable but generally damp conditions. Our G4 band managed a middle of the table 6th place whilst our G3 band was sorely beaten into 9th place by a plethora of excellent overseas bands. We did pick up a couple of prizes in the Branch confined competition though and enjoyed a good post games march down the street. In place of a band practice, we undertook a Beat Retreat at the Royal Yacht Britannia on the 6th August, beginning the week long build up to the World Pipe Band Championships. We were pleased to welcome back Lena Bernard from Bagad Moulin Vert as she joined us for the week ahead of the competition on Saturday. Both bands travelled across to Glasgow with the G4 band having an early start. Not so early as the Davidson’s Mains NJ band who made their Championship debut under Izzy Webster. The youngsters played well, ably cheered on by parents and supporters and were also interviewed by the BBC later in the day – apparently the youngest band within their grade! Both band’s days ended quite early this year. G4 had a mediocre run and placed a disappointing 16th out of 19 bands in their qualifying heat whilst G3 probably put on the best performance of the Season so far to place 10th out of 14 bands in their qualifier. There was some consolation though with the drummers placing 5th. So on what must have been the sunniest competition day of the year, both bands enjoyed the afternoon listening to how the best bands in the World do it before departing at a respectable hour for home. Prior to leaving Glasgow we bade farewell to Lena and Casper who both returned to their respective countries and we look forward to seeing them back across here again soon. August 19th saw the band competing at the Edinburgh Pipe Band Championships held at the Royal Highland Centre, Ingliston. Both bands played reasonably well but neither to their full potential with the only prize of the day being a 4th place in G3. The 2012 Season is now over for us and we are about to head off to perform at the Aventicum Musical Parade and Tattoo at Avenches, Switzerland. Once back we will be taking a break until the beginning of October when practices will resume. We’ll be starting our piping and drumming teaching programmes again over the winter months as well as learning new competition material for the 2013 Season. After a two week break the band undertook a Beat Retreat at the Royal Yacht Britannia on the 26th July before heading across to the European Championships held at Stormont, Belfast on the 28th July. We enjoyed a good trip across for what is the last visit to Belfast as the Championships will now be held in Forres for the next three years. Our G4 band had a decent run in their qualifier but just missed out on a place in the final. Our G3 band was plagued with sound issues right up to the line and struggled through their performance to finish 2nd last. Despite this, it was an enjoyable trip and we look forward to returning to Belfast sometime soon. On Friday 1st June a mini-band entertained a group of Swiss Criminalologist at the Radisson Blue hotel on the Royal Mile and on Sunday 3rd June we performed for the local Stockbridge Colonies Jubilee street party. Saturday 9th June saw us fielding two bands to lead the Uphall and Kirkliston gala parades under glorious sunshine, with the kids from the Davidson’s Mains pipe band entertaining the crowds at the local Stockbridge Primary School gala and St Serfs church Jubilee fete on Ferry Road. By far, the busiest day of the year for us. Congratulations to band member Archie Hodgson who placed 3rd competing against 11 other youngsters in the Intermediate Solo Snare drumming competition held as part of the Scottish Schools pipe band and solos competition at Dollar Academy on Sunday 13th June. 13 year old Archie currently studies at Edinburgh Academy, receiving drumming tuition from Steven McWhirter. The 11th Innerleithen Pipe Band Championships was a very wet and miserable affair. Persistent rain throughout the day dampened everyone’s spirits, and with few spectators there and the surrounding vistas obscured by clouds we were glad to be homeward bound with a couple of 4th place trophies. At the some time, a combined Stockbridge and Davidson’s Mains band led the Davidson’s Mains Gala parade to a similarly wet event at Lauriston Castle. At the end of the month the band travelled to the British Championships in Annan. It’s always a pleasant trip down through the Scottish Borders to this part of the country – the last trip to this location as the British Championships will now be held in Bathgate for the next three years. Our G3 band were on first with the new MSR. Things didn’t really go to plan and after a performance lacking in drive and riddled with mistakes, a disappointing 12th was the final placing. Our G4 band had a much better run, albeit not perfect, and we were delighted to pick up a 6th place trophy for our efforts. We extend a warm welcome to Casper Nellerman, PM of the Aalborg Pipe Band, Denmark who is joining us this Season at various competitions over the summer. The month started well with the confirmation of our attendance at the 2012 Aventicum Musical Parade, held from the 5th-8th September at the Roman amphitheatre of Avenches, Switzerland. During our week-long stay the band will be performing as part of a massed pipes and drums tattoo held within the amphitheatre each night along with individual performances in Bern and Fribourg. Dunbar Highland Games was the first outdoor competition of the Season held on Saturday May 12th. Our G4 band held to a decent performance after a slightly rocky start in the open grade but had a less than satisfactory run in the MAP MSR competition. G3 produced a solid medley performance albeit a little on the cautious side, much better than the G2 MSR performance which was riddled with mistakes. For both bands, playing twice proved to be a challenge and the end result was some quite low placings all round. Many thanks to everyone who donated jumble, baked cakes and staffed our stall at the Stockbridge Colonies Yard Sale on Sunday 13th May. Despite the rain we made a very worthy £245 towards band funds. The Scottish Pipe Band Championships were held once again in Dumbarton on May 19th. Another cold day meant it took a while for both bands to get the pipes up to pitch. G4 had a much better run than at Dunbar in G4A with the MSR showing promise for improvement over the Season. G3 played a large band and again produced a decent performance but with a couple of mistakes and lacking drive, it was less than satisfactory. Despite neither band making the prize list, it was a good day out, with a significant number of new members making their competition debut. Bathgate Highland Games was held on Saturday 26th May and in a change to the weather of the past two competitions it was pleasantly sunny. This enabled us to have shorter tune-ups and attain a slightly sharper sound which may have helped with both bands performances. G4 placed 2nd overall with the drum corps also placing 2nd out of 10 bands and G3 placed 2nd overall too. And we were delighted to see the youngsters of the Davidson’s Mains pipe band appearing at their first ever outdoor competition. The teeny tots took the whole thing in their stride and produced a very credible first performance under the watchful eyes of the judges and a large crowd. Well done to Izzy Webster who also made her outdoor competition PM debut. Finally, we are delighted to have received a grant from Scotmid Co-operative to assist with the purchase of uniforms for some of our younger players. The Scotmid Community Grant provides support for local communities, aiming to help enhance the lives of people, and to help promote co-operative values and principles. The Community Grant focuses on providing support to children/ education, health, fairtrade, homeless/poverty, arts & culture, environment, elderly and active lifestyles. Unfortunately we had to say farewell to Leah Strauch who returned to Melbourne after nearly two years learning piping and tenor drumming with the band. The band were out Beating a Retreat at Oxenfoord Castle on 26th April for some Russian businessmen. On Saturday 28th April the band travelled up to Forfar for the Dundee, Perth & Angus Branch mini-band competition. This was a first competitive outing for some band members with our new G4 leading tip, Angela Hague, having her first run out with the band. Our former leading tip has had to take a back seat as he is currently working in London. Compared with the steady performances exhibited at last month’s mini-band competition every band seemed to suffer from nerves and silly mistakes ensuring that none of our six entries were in the prize list. Prior to performing at this year’s Easter Cavalcade, we were contacted by the Palm Springs Spirit of the Sands marching band from California to arrange a sort of meet and greet workshop with their 75-strong kids band. Held at the Hilton Grosvenor hotel, our two bands met for 3 hours of small group workshops which included letting them try out piping, drumming and highland dancing along with performances from both bands. Everyone had an excellent time – for the college students they gained exposure to the Scottish musical culture and we 100% engaged and enthusiastic with what we had to offer and for us it was an excellent opportunity to teach people about what we do and take for granted in terms of musical skill and ability. There followed a busy Sunday with the band performing at the Ceilidh Culture street party on Castle Street for an hour or so and then heading down into Princes St Gardens West to join the Palm Springs band for the official Easter Cavalcade. Cold and wet weather prevailed throughout – we can only hope that summer is just around the corner! We extend a warm welcome to Fiona Boyle from Melbourne who joins us whilst living in Edinburgh. Fiona used to play with the Watsonia RSL Pipes and Drums and is also a talented highland dancer. Finally congratulations to band members Sharon and Colin Winter on the birth of their first son, Gregor . We wish the three of them all the best and look forward to wee Gregor’s first appearances with the band! We are very pleased to announce that the RSPBA Music Board has approved our request for our G4B band to be upgraded to G4A for the Major Championships in 2012. We have a solid band who have been working hard over the winter months in preparation for this coming Season but would welcome enquiries from any experienced pipers and drummers interested in competing with our G4A band this year. The band’s first gig of 2012 was for the John Lewis Partners Burns Supper on the 24th January, where a mini-band entertained the assembled guests.Our second outing was something a little out of the ordinary – performing for the BBC Radio 5LIVE special Six Nations preview show live from Watsonians Rugby Club, Edinburgh. Matt Dawson hosted the show with guests Chris Patterson, Gavin Hastings, Andy Robinson and Ian Robertson. We opened the show’s live chapters, played in the guests and closed the show. All live, on the Red Button, and heard as far away as Kuala Lumpar! Many thanks to the Lothian & Borders Police Pipe Band for their recent donation of Ross Canister spares. Many of the parts required for the older model of canister appear to no longer be available so this is a huge help in keeping some of our competing pipers pipes dry and also enabling us to build up second hand canisters for our learner and younger pipers. And we are pleased to welcome pipers William Cameron, Bruce Clarke and Ben Robertson who join our G3 band, Tony Park who rejoins the G3 drummers, piper Steven Knight who joins our G4 band, drummers Euan Todd, Angela De Jager and Karen Reynolds who all join our G4 drum corps and learners Tom Gallagher, Harry Strachan, Calum Everett, Gordon Telfner, John Edmund and Sebastian Mitchell. The band’s Christmas Party was once again held at the Hawke and Hunter hotel on Picardy Place on Saturday 10th December with around 60 guests attending the gathering for drinks and a buffet before heading out for a meal and a night on the town. And as tradition now dictates, we fielded a sizable band the following day for the Wish Upon A Star Charity Santa Stroll in Princes St Gardens. With the entire band dressed up in Santa outfits, the cobwebs were well and truly blown out from the night before! We were pleased to be asked to help launch Edinburgh’s spectacular calendar of Christmas events on Tuesday 8th November at the Ghillie Dhu, Rutland Place. Along with Santa and the Ice Queen the band performed for industry reporters, councillors and the Lord Provost at the press launch organised to showcase what Edinburgh’s Christmas, commissioned by the City of Edinburgh Council, has lined up for the Festive period. On Thursday 24th November, the band led delegates and councillors onto the Mound for the official switching on of the Christmas Lights before the celebrations kicked off with a 14-metre high snow queen model featuring pyrotechnic effects. We then led the assembled crowds along Princes Street to St Andrew’s Square for more Christmas celebrations. And on Sunday 27th November the band performed at the finale of the St Andrew’s Day Celebrations at Edinburgh Castle. The Esplanade was brought to life by a combination of fire animation, ice sculptures and sensational firedrawings and the glow of lanterns created by local schoolchildren. The band performed at intervals throughout and a lone piper accompanied a narration highlighting Scotland’s greatest individuals set against a visually stunning projection onto one of Scotland’s greatest landmarks, all rounded off with the customary, jaw-dropping fireworks display. Over the past few weeks we have been pleased to extend a warm welcome to the following new members: Peter Mueller joins us from the Swiss Midland Pipe Band whilst working in Edinburgh, Janne Hansen joins us from Denmark’s Aalborg Pipe Band via Dublin’s Malahide Pipe Band, Eddie Sheilds, Lewis Will, Calum Reynolds who also plays with Edinburgh Academy Pipe Band, Hannah Gunn, Stuart Strachan, Cameron Taylor, formerly of ESM Pipe Band and Campbell Watson. We’re also pleased to welcome learners Ruben Ronne, Elian Heins, Adam Hook, Freya Clenshaw and Matthew Milne. And we say farewell to Ross Martin who leaves us to join Lothian Borders Police Pipe Band and Ross Elliot who leaves to re-join his old band in a new guise, Scottish Borders Pipe Band, wishing them both all the best for the future. Despite taking a break at the end of the 2011 Season, the band was in action several times during September, performing Beat Retreats at Hopetoun House on the 3rd September, Dalmeny House on the 4th September, Mansfield Traquair on the 24th September and Archerfield House on the 27th September. A mini-band also performed on Friday 14th October for some international delegates at the Edinburgh Training and Conference Venue on St Mary’s Street. Practices resumed towards the end of October and the main focus at this time of year is now on building towards the 2012 Season. New music and scores have been issued and we are pleased to have secured the assistance once again of Scott Walsh and Matt Wilson in helping tutor the band in preparation. The final competition of the Season was held on yet another wet and wild day, Sunday 11th, at Peebles. G4 got the best of the weather early on and put in a very credible performance to earn them 4th place out of the 13 bands. G3 had less luck; with logistical issues delaying the proceedings, combined with the cold weather, we were very glad to eventually compete in both G3 and G2 pretty much back-to-back, placing 5th in G3 and 3rd in G2. This competition also concludes the Branch Championships and for the second year running our G3 band was crowned Branch Champion of Champions. The band is now on a break until October 20th when we will resume for the winter practice and the build towards 2012. We are always looking for new members; be you a beginner or novice looking to improve your playing, or an experienced player looking for a new challenge. Email the band at stockbridgepipeband@hotmail.com for more information. North Berwick Highland Games kicked off the month with a day which started sunny and clear and ended in massed bands being cancelled due to the continuous rain. G4 achieved their highest place of the Season and showed good promise for the Worlds – thanks to Mr Milligan for PM-ing the G4 band in Clare’s absence. And G3, playing with a small band, managed a solid run in the G3 medley competition, and whilst not in the Open prizelist, picked up a Confined trophy. And despite a less than convincing run through the MSR in G2 we also managed to collect another Confined trophy. The pinnacle of the competing events, the World Pipe Band Championships, was held once again on Glasgow Green, on the 13th August. Our G4B band were drawn to compete at 9:07am in their heat so it was a very early start as we headed west. The band has the toughest heat of three, with several Major prize winners in the mix, and despite a very well executed performance, placed 5th. With only three bands going through it was a very quick end to the day. G3B had a steady tune-up for their heat at 1:32pm and after being whisked off to play for the Drum Majors, were delighted to qualify for the Final from another tough heat. Great as it was to make the Final, unsettled weather effected our tune-up and with the pipes not sounding as well as they could, our performance was also not as good as we knew we could deliver. Still, an improvement from 2010 when we failed to qualify, and when the results showed that we’d placed 7th overall, it was a mixture of frustration on just missing out on the prizes and simultaneous pride at having progressed this far from last year. A special thanks to those who travelled from different corners of the country and even further afield to compete with us on this day. Saturday 20th saw the band back at the Melrose Pipe Band competition. A smaller entry than normal meant a quicker competition with the G4 band playing particularly well in the MAP MSR competition. G3 put on a dismal MSR performance, placing last but improved somewhat for the medley competition in G2. Still, we managed to pick up a couple of prizes, also winning one of the prizes for the street march. Our Game will need to be up-ed however if we wish to secure any prizes at next weekend’s final Major. The day of the Cowal Pipe Band Championships dawned bright and early, but we were afforded a longer lie than usual and despite concerns about Ferry delays, we were in the park for 11:00am. Our G4B band had a good tune up despite the changeable weather conditions and managed a respectable 2nd place in their qualifying heat to secure a place in the Final. Next up, and the G3B band put on a solid performance in their grade but didn’t quite capture the confident playing evident on the tuning park. Then the G4B band were on again for their Final, delivering a better performance than the morning qualifier. All done and dusted, the sun shone for the remainder of the evening and as we gathered in the shady hollow in front of the main stand for the prizegiving, we were delighted to hear G4B win 4th place and G3B win 5th place! And a particular mention for our G4B drummers who placed 2nd. Quite a party ensued on the coach home and it was a rowdy bunch who returned to Edinburgh with their silverware! The first two weeks of the month were spent rehearsing for the trip to Brittany but we did manage a Wedding Beat Retreat at Dundas Castle on July 10th for a local couple from Stockbridge. From the 18th – 25th of July the band participated in the 88th Festival de Cornouaille in Quimper. Arranged with help from Lena Bernard of Bagad Moulin Vert, we enjoyed one of our best trips to a festival of this nature with some excellent music and socialising. Quimper is a picturesque town and it’s people are exceedingly friendly – never a dull moment or quiet night was had for the duration of the trip. A full trip diary and photo gallery will be added in due course. As usual, June was a busy month for the band. During the first weekend the band performed at our local Stockbridge Primary School Gala on the Saturday with a rare performance at the Botanic Gardens for the Eden Project’s community Big Lunch Event on the Sunday. St Serfs Church Fair and Uphall Gala Day both fell on the second Saturday of the month with a mini-band attending St Serfs and a full band leading the Uphall parade. And that evening, a mini-band performed a at Balbirnie House in Fife for a wedding reception. The following weekend the Davidson Mains Gala and the Innerleithen branch contest fell on the same day. A sizable band led by Gavin Hamilton and aided by drummers from Erskine Stewart Melville College led the Gala Parade whilst the G4 and G3 bands travelled south for the competition. Our G4 band played well but were bested by the G4A bands in the open competition, finishing 5th whilst our G3 band faired no better, also finishing 5th and 3rd in G2. And the weather was so bad that massed bands were cancelled for a second time this Season. The final weekend was reserved for the British Championships at Annan. Weather was still an issue and under changeable conditions our G3B band tuned up to compete first on at 11:20am. We didn’t have a bad run but it wasn’t confident and there were several mistakes – but we were still a little surprised to place 12th out of 15 bands! Luckily our G4B managed a very solid run in their competition at 3:00pm and were rewarded with a 4th place. Massed bands was held under blustery, cold and wet conditions and we were glad to board the coach and head back up to Edinburgh. With June done, it was time to knuckle down and get our concert material polished up for the forthcoming trip to Quimper in late July. Stockbridge Pipe Band is pleased to confirm our participation in the 2011 Festival de Cornouaille in Quimper, Brittany. The Festival runs from July 18-24 and is the second biggest Celtic Festival in Brittany after the Interceltique Festival in Lorient, which the band attended in 2009. The band will be taking 30 members to perform at a variety of concerts and parades, whilst sampling the best of Breton crepes and cider that Quimper has to offer. The first outdoor competition of the year was at a rather cold and blustery Dunbar on Saturday 14th May. Whilst our G4 band played fairly well for their first outing as a unit, placing 10th out of 18 bands, our G3 band’s performances were memorable for all the wrong reasons, placing last out of seven bands in G3 and 6th out of seven bands in G2. However, not being too disheartened we all headed of to Keith and Annie Milligan’s house for a barbeque and some post competition analysis. Many thanks to them both for putting on an excellent spread. With only one week to improve on Dunbar’s results both band put in some extra effort in preparation for the Scottish Championships at Dumbarton. The traditional weather was there to welcome us – biting winds, driving rain and sub-zero temperatures. However, it was consistent throughout the day, with Massed Bands being cancelled by 3pm, so we were all in it together. Our G4B were unfortunate enough to catch some of the worst weather that day, but held a solid performance together to place 6th overall out of 21 bands. And our G3 band redeemed themselves somewhat with a first place in a very tight top three, our drummers also winning to secure both the Band and Drumming Scottish Champions title for 2011! Congratulations to both Bands! The final competition in May was the West Lothian Highland Games held in Bathgate. Our G3 band didn’t compete this year but our G4 band took this event as an opportunity to field some of our less experienced members who had never competed before. Well done to all those who played. Finally, we are pleased to welcome pipers John Kerr, Elias Bischof, and Keith Donald. The band had its first outdoor performance of the year at the Ceilidh Culture Street Fair, Castle Street, on a rather wet Saturday 23rd. A large band turned out for the event but the weather didn’t hold and in a similar style to last year, rain stopped play. We were pleased therefore to move indoors for the next engagement – the John Lewis Edinburgh AGM, held at the Corn Exchange on Wednesday 27th. The band opened the event onstage for the 800 employees before the MD presented his annual review. Our second indoor mini-band competition of the year was the Dundee, Perth and Angus Branch competition held at Forfar Academy on Saturday 30th April. We entered two Trios in the open MSR competition and mini-bands in Grades 4, 3 and 2. Our Trios placed 3rd and 8th out of eight Trios, our G4 bands placed 3rd and 7th out of 25 bands and our G3 band placed 2nd in G3 and 3rd in G2. We’d like to extend a warm welcome to Sharon Winter who has joined the G4 mid-section. With the excitement of the Ceilidh over, it was down to business in preparation for the Lothian and Borders Branch indoor competition One of several drumming workshops planned for this year was conducted with Scott Walsh early in the month and the band stepped up a gear as the practices took us closer to the first competition of the Season. The Mini-band and Solo competition was held a month earlier than normal at Peebles High School on Saturday 26th March. During the morning several members of the band were involved in various solo competitions – Congratulations to Shay Reid who placed 4th in the under 14 Tenor Drumming event, Leah Muirhead who placed in the under 18 Snare Drumming event, Andrew McCaig who placed 3rd in the over 18 Snare Drumming event, and Jamie Westhead who placed 4th in the under 14 Solo Piping event. In the afternoon, our G4 bands placed 3rd (with a 1st for piping) and 8th in G4, whilst our G3 bands placed 2nd (with a 1st for drumming) and 4th in G3 and 3rd and 5th in G2. It was a long day overall but worth the effort in getting both bands ready for this earlier date. During February the band member’s noses were kept to the grindstone as we prepared for our Fundraising Ceildih on Friday 25th. This year’s venue was The Hub, a classy and rather sumptuous venue located at the top of the Royal Mile. We were delighted to receive 298 guests who danced the night away to the Thistle-Do Ceilidh band with our own band performing three times throughout the evening – first a performance by the Grade 4 band which featured the first airing of their new competition set, then a joint performance from both our Grade 4 and 3 Bands with backing accompaniment, and then finally the Grade 3 band on their own who also aired their new competition medley. A substantial sum was raised towards the band’s running costs and a big thank you is due to everyone who helped make this event such a success. We are pleased to welcome piper Carolyn McKee who joins us from the Lochaber Schools Pipe Band whilst studying in Edinburgh. The New Year got off to a flying start with the news that John Lewis Edinburgh is able to continue their support of our organisation with a generous donation of £1000. Many thanks to band member Karen Cuthbertson and Community Liaison Coordinator Susan Blair for their assistance in securing this donation. The Craigmount High School pipe band Juvenile solo competition was held on the 15th January – congratulations to Shay Reid, Leah Muirhead and Jamie Westhead (son of Keith Westhead) who all picked up prizes. The event was well attended and it was encouraging to see so many youngsters working hard at their disciplines so early in the Season. And the band was out three weekends in a row this month, playing for a wedding at The Quay, Musselburgh, followed by a corporate performance for some visiting Germans at Alexander House, Auchterarder, and then finally a Burns Supper at Craigiehall Officers Mess, 2nd Division HQ, Kirkliston. We’d like to extend a warm welcome to some new members; drummers Leah Muirhead who plays for Stewart’s Melville College and Archie Hodgson who currently plays with Edinburgh Academy, Jura Lewis, Zak MacRae and Silvia Nerreter who are learning the pipes and Ben Tuggle, who joins us from Ames Iowa, USA. Ben currently plays quad tenor with the 250 strong Ames High School Marching Band and will be learning tenor with us whilst he and his family spend a few months in Edinburgh. The band held its Christmas Party at the Hawke and Hunter hotel on Saturday 11th December. Around 50 band members, friends, family and guests joined us in the Whisky Room. Santa stopped by once again and we were pleased to award £50 John Lewis vouchers to our 2010 Most Improved drummer, Michael Binder, and piper Izzy Webster. After the official party we moved to the Apex hotel on Waterloo Place for dinner and then into town for a few drinks. Many thanks to everyone who came along, including those who travelled from the far north and west of Scotland to join us. Our final performance of 2010 was for the Wish-Upon-A-Star charity Santa Stroll through Princes St Gardens. Braving freezing conditions and nurturing some severe hangovers, 25 band members dressed up in Santa costumes for the 5th year running to play at the beginning of the stroll. And with only a couple more practice nights until Christmas the band will be taking a short break before resuming practice on Thursday 6th January. May we take this opportunity to wish all band members, family, supporters and friends a very Merry Christmas and a Prosperous New Year. The band continued its busy autumn schedule beginning with a novel gig for three of the band’s snare drummers on Thursday 4th November. Dressed as Festive Soldiers they performed at the official City of Edinburgh Christmas Launch at the Hawke and Hunter boutique hotel before taking part in a photo shoot press launch. On Thursday November 11th the band led the first Charity Giraffe Parade through Stockbridge. The event, organised by a group of local Stockbridge businesses, aims to raise money for two local charities through the auctioning 40 five feet tall giraffes which have been decorated by the businesses. The band hasn’t historically been involved in Remembrance Day parades, but we were delighted to be asked by the Royal British Legion to lead the first Remembrance event of its kind in Edinburgh on Sunday 14th November. Assembling at the top of the Royal Mile, 19 pipers and 14 drummers led a parade of serving and ex-service personnel and civilian organisations to St Giles Cathedral as part of the ceremony held at the Stone of Remembrance outside the City Chambers. Saturday, November 20th saw a mini-band perform at a Wedding reception in the Mansfield Traquair on Broughton Street and on Saturday 27th we fielded a large band to lead the fifth annual St Andrew’s Day Rally from the Castle down a rather icy and treacherous Royal Mile to the Parliament. The annual shift of band personnel at the end of the Season began with the departure of Tony Park to Newtongrange; with him go Rab McCutcheon, Graham Wilson, Chris Winton, Thomas Bryce, Louise Park, Stephanie Winton and Calum Arundrel. Alan Rennie has also left to re-join the Penicuik pipe band. And Kate Spowart has joined the Milngavie pipe band – Kate had been travelling through from Glasgow to practice with us but we wish her well with her new local band. However, we’re pleased to welcome pipers Rachel Gray, formerly Boghall and Bathgate Juvenile pipe band, Yentl Schattevoet from the MacMillan pipe band in the Netherlands, Craig McDonald from Aberdeen and Matt Jones who returns after a year’s sabbatical. And welcome also to snare drummers Ross Elliot from Hawick pipe band, Josie Mallinson from Glenalmond pipe band, Kirsty Harper formerly of Craigmount High School pipe band and tenor drummers Clare Campbell and Kirstin Anderson. And we’re also pleased to welcome learners Daniel Millington and Leah Strauch who is from Melbourne. After a short break the band was back in action five times in October. First we performed a Corporate Beat Retreat at the Royal Yacht Britannia on Monday 4th October, and then a mini-band performed at a Wedding reception at the Corn Exchange on Saturday 9th October. Sunday 10th saw the band participating in the Dusherra Parade which wound its way across the city centre and up Calton Hill, whilst on Saturday 16th the band travelled east to perform at another Wedding reception at the Marine Hotel in North Berwick. And finally, on Sunday 31st the band performed another Corporate Beat Retreat at Gosford House near Aberlady. Unfortunately we have lost a couple of players due to the current economic climate. G3 piper Grant Ingram has had to return to Aberdeen to secure employment and we have had to say goodbye our G4 Pipe Major Blair Milne who lost his job in Edinburgh and was forced to return to his native Turriff for work. Blair was with the band for almost three years, playing with the band for two seasons and leading the newly formed G4 band to three Championship placings in 2010 as well as being the G3 Pipe Sergeant. To mark his departure and to express our gratitude for his time with Stockbridge, a small presentation took place when the band was in Bergamo. Both Grant and Blair are now travelling to practices with Blair’s former band, Grampian Police Pipe Band and we wish them all the best for 2011. So with an important position to fill, we’re delighted to announce that another former Grampian Police piper, Clare Miller, has succeeded Blair as Pipe Major of the G4 band. Clare has been with us for two years, currently plays snare in the G3 band and we welcome her on board also as a PM now and wish her every success in this role. The big news for this month was the Wedding of two band members, Leonie Postma and Clare Miller, on Friday 24th September at the Corn Exchange in Edinburgh. Leonie and Clare tied the knot at a Civil Partnership service after meeting each other at a pipe band competition when Clare was playing with the Grampian Police pipe band. We were delighted to join them, along with members of the Grampian Police, Portlethen and Dronten and District pipe bands, in celebrating this special occasion and we wish them both a long, healthy and very happy life together. The final competition of the Season was held at Peebles Highland Games on the 12th September. We fielded a slightly larger band than normal in Grade 4 with some new members getting their first run out at competing. Despite a few mistakes the band were delighted to place 2nd overall; and with a 2nd place for drumming as well our Grade 4 drummers were crowned Lothian and Borders Branch Champions for 2010! Our G3 bid also did well, placing 4th in Grade 3 and also taking the Branch Grade 3 band and drumming Champions of Champions title. So a fitting end to a good Season for both bands, especially as this was our first year in both our respective new grades. Many thanks to everyone for all their hard work and dedication over the past 12 months. And a big thank you to Matt Wilson, Scott Walsh and Alan Jordan for their invaluable assistance at various times throughout the year. On Friday 17th September 11 pipers and 8 drummers departed for Bergamo, Milan from Prestwick Airport to participate in the first “Bergamo On Pipes” international bagpipe festival. This two day event saw the band perform an evening concert in the town of Martinengo just south of Bergamo and then a morning parade and afternoon concert and massed bands event on the Sunday in Bergamo city centre. A full trip diary and photos will be added soon. And after our trip to Bergamo we said farewell to Ashley Kirby who returned to Ontario via Ireland. With five competitions ahead, August is always a demanding month but it can equally be very productive, particularly with the band playing together so frequently. The first competition was North Berwick Highland Games, held on the 7th August. Our Grade 4 band were drawn first that morning and found themselves tuning up at an un-earthly hour. Several unfortunate mistakes meant they placed 5th overall out of 10 bands. However, North Berwick also has a confined competition for Lothian and Borders branch bands only and in this the band placed 4th. The Grade 3 band had a solid and well composed run at the MSR in Grade 3 and were very pleased to place 3rd with only one point separating them from a 2nd place. And thus we placed 2nd to Linlithgow in the confined competition. However, a less than satisfactory run in Grade 2 saw us place last! The following weekend was the pinnacle of the pipe band competitive season with the World Championships once again being held on Glasgow Green. Our Grade 4 band was on first and delivered a solid performance in their heat to ensure successful qualification in G4B. Next up was the Grade 3 band which also had a qualifying heat; despite a solid performance from the drummers and a good overall ensemble placing, the piping was not up to the job and we frustratingly missed out on qualifying by one place. With no time to lament this, the Grade 4 band was back on for their Final. Performing well, but not quite as tightly as they did in the qualifier, they were non-the-less delighted to place 6th out of 60 bands! Congratulations to everyone who worked hard to achieve this excellent result. The following day the band travelled north to compete at Perth Highland Games on the South Inch. It was a beautiful day and despite reduced numbers and some sore heads both bands performed well, winning Grade 4 and Grade 3. Melrose Pipe Band Competition was held on the 21st August. Under changeable weather we competed three times placing 3rd in Grade 4, 5th in Grade 3 and 6th in Grade 2. The Grade 4 band played well showing continued improvement but it wasn’t a great result for our Grade 3 band. However, it was all good practice for the next competition at Cowal the following week. And Melrose was the last competition for Kelly Henderson who returned to New York after completing her studies in Edinburgh. Kelly and her partner Ray fully embraced the Scottish pipe band scene and we hope to see them back here soon. After an enjoyable but early journey over to Dunoon we arrived ready to give the last Major of the Season, the Cowal Championships, our best shot. Once again the Grade 4 band had to get through a qualifying heat in G4B and did this with impressive ease. For their Final though, the unpredictable Cowal weather turned nasty and the band had to play through one of the worst squalls of the day. Our Grade 3 band had better luck in G3B and delivered a strong medley performance. With both bands assembled for the March Past and street parade we nervously awaited the results. Only a matter of points separated our Grade 4 drummers from the possibility of winning the Champion of Champions Title for a second time and when it was announced that they had won the drumming in G4B and subsequently the Champion of Champions Title it was cheers, whoops and hugs all round. Congratulations to Shane and his corps on this magnificent achievement! And we were delighted to hear our Grade 3 band announced in 4th place in 3B as well. At the end of August we had to say farewell to Teale Failla who returned to New York after completing her studies in Edinburgh. Teale is an award winning filmmaker, photographer, and broadcasting professional as well as a prize-winning drummer and we wish her every success for the future and hope to see her back in Scotland again soon! After a two-week break, the band performed at the International Clay Pigeon Shooting Dinner held at the Inchyra MacDonald Hotel, Grangemouth on the 16th June. And the following Monday we undertook a quick performance at the Féte de la Musique festival held at the French Institute in Edinburgh. The 17th July was a special day for our G3 Leading Drummer, Andrew McCaig, who married his long-term partner, Chloe Boulanger. The wedding service took place at Loretto Chapel in Musselburgh, with pipers from Stockbridge and Loretto playing for the service before everyone adjourned to Pinkie House for the reception. A mini-band performed for the assembled guests after the meal and then the partying continued early into the next morning before Mr and Mrs McCaig jetted off for a well-deserved honeymoon together. We wish them both a very healthy and prosperous life together. July 24th saw the Band attend a new competition at Airth Highland Games. It was a pleasant day out with our Grade 4 band drawing for 1st place with Fraserburgh RBL but being pipped into 2nd place on an ensemble preference. Our Grade 3 band did well to place 2nd and also managed a 3rd place in Grade 2. The European Championships were held at Stormont in Belfast on 31st July. The band travelled over on the Friday and we were pleased to stay once again at Stranmillis University. After a short drive on Saturday we arrived at the competition field in plenty of time. Our G3B band were on first and after a good initial tune-up a 20 minute downpour scuppered further progress and we were left with half an hour to get the band going before we were due on. Granted we weren’t unlucky enough to end up playing through it but it certainly had an impact, especially on our drone tuning. A disappointing 10th place was all we could muster although our drummers placed a credible 5th. Thankfully the rains passed and our G4B band enjoyed a much better tune-up and performed very well, securing a 4th place. Once back at Stranmillis there was time for a quick change before heading out for dinner and some celebratory drinks in the City centre. June, as usual, was the Band’s busiest month for engagements. On Saturday 5th a mini-band performed at the local Stockbridge Primary School Gala whilst the following day a full band performed a Beat Retreat for Corporate clients at Oxenfoord Castle just south of Edinburgh. Saturday 12th June saw us perform three times; once at St Serfs Church Fete in Goldenacre, then out in West Lothian at Uphall Gala Day and finally at a Beat Retreat for corporate clients at the Royal Yacht Britannia. The following weekend we fielded one band to perform at Davidson Mains Gala Day whilst both our Grade 4 and Grade 3 bands competed at the Innerleithen Branch competition. Our Grade 4 band placed 4th and our Grade 3 band placed 3rd in Grade 3 and 4th in Grade 2. Bo’ness Fair Day Parade took place on Friday 25th and we enjoyed a good day out at one of the oldest Children’s Fairs in the country before an early start the next day for the British Championships at Annan. Scorching sunshine day granted both bands a good day out at the second Major of the Season; our Grade 4 band really pulled the stops out winning second place in G4B whilst the Grade 3 band put on a decent performance to see them place 5th in G3B. This was the first time that both bands had placed and was certainly a 2010 Season high-point! The month of May began with the band leading the Edinburgh May Day Parade from East Market St up the Royal Mile, down into the Grassmarket and along into Princes Street Gardens. Fielding 22 pipers and 14 drummers, we were please to get the majority of both our G4 and G3 bands out together for a performance prior to the first outdoor competition of the Season. Which was held in Dunbar on Saturday 8th at a new venue near the centre of the town. Despite being much more sheltered than Winterfield Park, it did little to protect against the bitterly cold morning during which the G4 band made its first foray into the outdoor Competition scene. Simple mistakes marred an otherwise good performance but the drumming as confident and well expressed and proved to be the best on the day, with the band placing 16th out of 23 and the drummers placing first! Our G3 band played well enough, and despite a few ensemble issues disrupting the performance, we were delighted to place 2nd overall and win the drumming as well! All in all, a confident start to the Season. Two weeks later and the first Major, the Scottish Championships, was upon us. With at least three of the five Majors beginning at 10:30am instead of the usual 9:00am, and the G3B band drawn to play at 1:30pm with the G4B band drawn to play at 4:30pm, it was very strange indeed to be leaving Edinburgh Academy halfway through the morning! Our G3B band had a bit of a rushed tune-up but had a reasonable run in the circle; integration and a few note errors marred this performance. And our G4B band played well but again note errors and some rushing tempered their performance. After a shorter than normal day, the results were announced with the G4B band placing 8th out of 22 band and their drummers placing 3rd. Our G3B band did especially well too for their first Major in this grade, placing 3rd overall. A good reward for everyone’s hard work over the winter months but still a lot more work to do to ensure we improve throughout the Season. Thus Bathgate Highland Games on the 29th May hopefully served as a reminder that we need to keep working hard; with neither band featuring in the prize list, our G4 drummers did, however, win the drumming prize for their Grade which helped perk up our spirits on the way home. Finally, we extend a warm welcome to piper Ashley Kirby who joins us from the Grand Celtic pipe band, Fergus, Ontario whilst working in Edinburgh, tenor drummer Stephanie Winton who joins from the local Craigmount High School pipe band and snare drummer Scott Black, formerly of Bo’ness pipe band who also joins the band. And we bid farewell to Pamela Matuszewski who has completed her studies in Edinburgh and returned to New York. Aside from lots of hard graft every Monday and Thursday night, April was marked by two events. The Ceilidh Culture Street Party was held, as part of the annual festival, on Castle St, and the band performed twice before rain cancelled play! Moving indoors, the Lothian & Borders branch Mini Band competition was held once again at Peebles High School on April 24th. Fielding two bands in Grades 4, 3 and 2, it was a busy day all round. Our G4 band’s competing debut saw them place 12th and 13th out of 19 bands whilst our G3 band placed 2nd and 4th outfit of 8 bands. And we also took possession of eight new Pearl snare drums which, combined with a recent purchase of second hand tenor and bass drums from Fife Constabulary, now ensures both of our band have a full compliment of drums. Kate Spowart returns to us after a few months with East Kilbride – we’re sorry to hear that it’s unlikely that they’ll be competing this year but look forward to locking horns with them again soon – and we welcome a couple of new learners, Mark Holloway and Scott Fraser. And Erin Allenby leaves us after a year with the band to continue her working holiday on the west coast of Scotland. The big news this month concerns the official formation of our new G4 band. Further to our promotion to G3B at the end of last year, and following on from our recent intake of new players, we have decided to form a G4 development band. Our aim with this band is to help facilitate our current learners and also those players who wish to strive for competition standard. Current G3 Pipe Sergeant Blair Milne will lead the band, aided by newly appointed Drum Sergeant Shane Finnegan. The RSPBA have confirmed that our new band will be competing in G4B for the 2010 Season and we’re all looking forward to the challenges and rewards competing with two bands will bring. On Saturday 20th we held a fundraising Ceilidh at the Roxy Art House in Edinburgh. This was a huge success with a sell-out audience of 250 family, friends and guests joining us for over 4 hours of dancing and music. The Thistle Do Ceilidh band provided the dance music whilst a joint performance from the G4 and G3 bands opened the first half with the G3 band performing another slot later in the evening. We also held a Grand Prize draw on the evening with a first prize of two tickets to the Scotland v England Six Nations rugby match at Murrayfield. Both events raised over £3500 towards band funds – essential to help us kit out our new players in both bands. We are also on a major funding drive to purchase new drums for the 2010 Season and money raised from these events will also help with this cost. Congratulations to one of our young learners, Izzy Webster, who placed 3rd in the under 12 years chanter class at the Craigmount Solo Competition at the beginning of December. Our first outing of 2010 saw us return to Craigiehall Officers’ Mess, Headquarters 2nd Division British Army, for their annual Burn’s Supper, with a series of mini-band performances throughout the evening. On the tuition front, we are delighted to have once again secured the services of Scott Walsh, HOE Shotts & Dykehead, and Matt Wilson, Field Marshall Montgomery as drumming and piping tutors. We are also pleased to welcome Allan Jordan, formerly of Boghall & Bathgate as our mid-section tutor. As series of workshops are now underway, aimed at improving multiple aspects of our overall performance, sound and ensemble. And we are pleased to welcome some more new pipers to our band; Pamela Matuszewski from Putnam Valley, New York and currently of Yorktown Irish Pipes & Drum, joins us whilst studying in Edinburgh, Thomas Bryce joins us from Craigmount High School and we’re also pleased to welcome Lena Bernard of Bagad Moulin Vert who joins us whilst working at the French Institute in Edinburgh. And welcome back to Colin Winter who re-joins us after a 12-month hiatus. Welcome also to Rab McCutheon, formerly of the Royal Scots Dragoon Guards and Alan Chalmers who both join the drum corps. December began with us leading the Stop Climate Chaos protest march from Bellahouston Park to Kelvingrove Park in Glasgow. We were delighted to be asked to lead this parade and did our best to keep spirits high despite the lengthy trek. Around 7000 marchers followed the band along the heavily policed route before assembling to hear speeches and rallies in Kelvingrove Park. 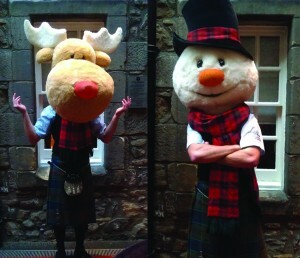 The following weekend we celebrated our Christmas Party at the Hawke & Hunter hotel on Picardy Place. Around 70 band members, friends, families and guests joined us for a party in the Cocktail Bar where we showed a short film of our Lorient trip highlights and a slideshow of 2009 photos. Santa once again made his appearance and we were also able to award £50 John Lewis vouchers to our most improved drummer (Teale Failla) and piper (Kate Spowart) for 2009. And once again, to cure the worst of the party hangovers, the following day we were out bright and early to play for the Wish-Upon-A-Star charity Santa Stroll through Princes St Gardens. 30 band members braved the cold to dress up as Santas for the 4th year running, playing prior to the start and as the 2500 Santas began their route round the gardens. And finally, our last gig of 2009, bringing our public appearances this year to 17 in total, was another Beat Retreat at the Royal Yacht Britannia on the 19th. In bitterly cold conditions following on from the snow that fell earlier in the day, the band played for 20 minutes alongside the ship for the assembled audience above. As is normal for this time of year, we’ve said goodbye to a few players and welcomed some more into our band. Scott Forrest, Jim Orr, Craig McGuire and Sara McLean all leave the band to focus on other pursuits. Craig McGuire was instrumental during his tenure as DS in bringing the drum corps up to competition level and we thank him for his commitment during this time. Kate Spowart leaves us to play with East Kilbride while she continues her studies in Glasgow. And to the drum corps we warmly welcome Michael Binder who moved to Edinburgh from Austria earlier this year, Islay Robertson from Wellington, New Zealand who joins us whilst working in Edinburgh, Ali Razvi; formerly from Craigmount High School, David Lowe, former DS at Heriot Academy, Alan Rennie from Penicuik, Graham Wilson; formerly a drummer with Newtongrange and Shay Reid who joins us from Methil. Whilst November saw us make good progress with our new competition sets in preparation for the 2010 competition season it was also a busy month engagement-wise. Our first outing was a very special affair; a 70th Wedding Anniversary party in Portobello for a pair of childhood sweethearts! Then on the 28th we paraded across the City in all directions, simultaneously leading two parades; one from the Castle to the Parliament for the annual St Andrew’s Rally Parade and the other from St Giles to St Andrew’s Square for the Homecoming Finale Art Car Parade. And on Sunday 29th we participated in the St Andrew’s Do Massed Pipes and Drums, parading from the City Chambers to the Castle Esplanade before performing a Beat Retreat along with the Vale of Athol, City of Edinburgh, Linlithgow and Tranent pipe bands. After a 4-week break, the band returned afresh to practices. Monday evenings continue to be held at Flora Stevenson Primary School in Comely Bank but our Thursday practices are now held at St James Church hall on Inverleith Row. The main news this month came via the RSPBA who confirmed our upgrading to 3B for the 2010 competition Season. We are delighted to have progressed swiftly through 4A and are looking forward to the challenges this new grade will bring. Congratulations to everyone who has made this possible; a lot of hard work, dedication and commitment over the past few years have certainly paid off. Our first gig of the winter season was a Beat Retreat with band performing outdoors for around 25 foreign guests at Preston Hall, just south of Edinburgh. Finally winding down for the end of the season, the band only performed twice this month. On Saturday 12th we travelled the short distance to Hopetoun House to perform a late-night Beat Retreat with the Burgh of Stirling pipe band. Then, on Sunday 13th, we travelled south to Peebles for the last Branch competition of the year. Being first on out of 17 bands we were keen to set a high standard and again, fielding a large band, we strode up to the line and delivered a solid performance in Grade 4. We also played up to Grade 3 but, despite some tight playing, bad blowing once again let us down; however, the drummers delivered one of their best runs of the season playing the medley. After enjoying a few beers in the glorious autumn sunshine we fell in for Massed Bands. As well as the competition held on the day, this event also marked the end of the Branch competitions with the 2009 Branch champions soon to be announced. We were delighted to win both the piping and drumming in Grade 4 and, with this win, were once again crowned the Grade 4 Branch Champions. Our drummers missed out on the drumming championship by one point to Newtongrange; congratulations to them and their young drummers on another excellent season. So, once suitably adorned with silverware, we joined the line of bands and played down through Peebles town centre before peeling off into our usual pub for a few pints. Once again, many thanks to Matt Wilson for helping with the tuning of the band. The band is now on another well-earned break until practices resume in mid-October. The month began with the band enjoying ten excellent days at the Interceltique Festival in Lorient, Brittany. We took a large band of 19 pipers and 12 drummers, and in addition to performing for five nights at the festival’s principal Magic Night show, we also had our own stage show, played a couple of parades, including the Grand Parade with more than 72 other bands, and performed outside the Scottish Tent in the Celtic Village. The Grand Parade was broadcast on French national television, as were most of the main events of the Festival, so this was good exposure for the band. It took about five hours for all the bands to march through the city and into the main stadium, and with deep crowds lining the parade route and the stadium filled to capacity this really was one of the highlights of the Festival. The Magic Nights, held in the main stadium in the centre of Lorient, were a three-hour spectacle of Celtic music and dance accompanied by a lighting and visual display and culminating in a ten-minute long fireworks finale. We performed alongside Methil and Toronto Police pipe bands for a 20-minute slot, also performing further massed band sets with the Irish pipe bands, Welsh choir and our old friends the Keltika Highland Dancers from Scotland. A couple of pipers, including our youngest player, twelve-year-old Lewis Blyth, were also invited to join Keltika’s piper Andy Gibb and drummer Lee Erskine on the main stage for part of the dancers’ set. We also entered an open pipe band and drum fanfare competition, competing against nine other bands including Toronto Police and another grade one band, the recently-promoted Bagad Cap Caval. Our drummers placed third in the fanfare competition, and we placed fifth in the medley and joint third in the MSR competitions. Our stage show at the Espace Marine was a very professional affair with over 2,000 people paying to watch us perform for almost an hour. We’d learnt new material for this event, which included backing musicians plus dancers from Keltika performing onstage with us, and everyone pulled out the stops to ensure we put on an excellent show. A mere five days after our return from Lorient it was time for the World Championships, held on Saturday 15th August at Glasgow Green. We were fortunate to have a decent competing time in the morning, but of the three qualification heats our heat was nicknamed the Heat of Death thanks to the number of bands in it who had previously placed at a Major this season. In wet and mucky conditions we tuned up swiftly and were relieved to deliver a solid performance, placing third equal with the University of Bedfordshire and earning us a place in the final. However, despite a good rest, the warm up to the final didn’t quite click and our performance was well off the standard we had previously been setting. It was therefore with little surprise that we stood at the end of the day, listening to the Grade 4A top six places and didn’t hear our name called out! This was the first time in nine Major Championship competitions that we’d failed to place and certainly overshadowed the excellent achievement earlier in the day when we qualified with confidence. So, keen to get ourselves back into the prize list, we travelled south to Melrose the following weekend to attend our third Branch competition. Fielding quite a small band, we were delighted to place first out of twelve bands in Grade 4. We also entered Grade 3, which gave us our second chance of the season to play our MSR, and despite fielding the minimum-sized competing band we were very pleased to place sixth out of eleven bands, with our pipers placing fifth. The Cowal Championships came round swiftly to mark the end of the Major Championship season for 2009. Held as ever in Dunoon, we had the luxury of a relatively late start, leaving Edinburgh at a civilised 8am, with a qualifying performance time of 12:38pm. Qualifying very well in joint first place with Quinn Memorial we were a little disappointed with our sixth place in the final, but acknowledged that we again didn’t deliver as strong a performance as we know we can muster. Still, we enjoyed the street parade and partied our way back across the country arriving back in Edinburgh just before midnight. Congratulations to Letterkenny and District, Quinn Memorial and Matt Boyd Memorial who have dominated Grade 4A this season. Given that this is our first year in 4A we are delighted to finish fourth in the Champion of Champions table, one point behind Quinn. After a hectic June the band took a two-week break to recharge the batteries, resuming practices in mid-July. As well as working on our competition sets we also began working on new material for our trip to the Interceltique Festival in Lorient at the beginning of August. On 18th July we travelled west to Balloch for the Loch Lomond Highland Games where we placed first in Grade 4, albeit in a relatively small competition. We also played up to Grade 3, which gave us another chance to play our medley; our drummers won first place and we placed fourth as a band out of nine bands. The European Championships were held on 25th July at Battery Park, Inverclyde. With glorious sunshine for most of the day, and exceptional views up to Loch Lomond, we all enjoyed a good day out. It was a long day, though (we left Edinburgh at 7am and didn’t return until 10pm), but our hard work over the last few weeks paid off and we qualified second in our heat before playing well to win third place in the final. Now we’ve just one practice left before we leave for Brittany. During our time in Lorient, as well as enjoying and absorbing the music, sights and sounds of the Festival, and doing our bit through various performances, parades and shows, we will be using the ten days playing together to work on our competition sets and overall band sound in preparation for the rest of the season. Once again June was an uber-busy month for the band. On 6th June we travelled to deepest Lanarkshire to compete at Shotts Highland Games. With this competition featuring a full set of judges, similar to the Major competitions, our aim was to take out a large band in Grade 4 and gain as much feedback as possible. With 15 pipers and 10 drummers we played well enough to win the drumming prize and place second out of nine bands. Well done to those previously non-competing members who debuted at this event. We also entered Grade 3 with our medley and despite an instrument malfunction occurring with one of our pipers, the band did well to keep focused and produced a relatively solid performance. On the same day, a group of pipers, including some of our youngest players, entertained the crowds at the Stockbridge Primary School Fete. Well done to those who made their first appearance with the band! The following weekend was another double event with a sizeable band led by Scott and Erin participating in the Leith Pageant whilst the competing band travelled to the branch competition at Innerleithen. Once again we won the Grade 4 band, drumming and best bass section trophies and were very pleased to place sixth out of eleven bands in Grade 3. The following weekend a large band led the Davidson Mains Gala parade to Lauriston Castle, once again providing an opportunity for our newer and non-competing members to play with the band. And at the same time, another group of pipers, again including some of our younger players, entertained the crowds at the St Serfs Church Fete. The next day the band travelled to Eglinton, south of Glasgow, to perform at the opening of the Eglinton Arms Hotel. This performance was thanks to a winning bid by the hotel’s owner at the MacMillan Cancer Trust auction held earlier this year. The band played several times throughout the afternoon outside the hotel, entertaining a steady stream of guests and locals. To round off a busy month, we travelled to Belfast on Friday 24th June in preparation for the British Championships at Banbridge the following day. Once again we stayed at Stranmillis University campus and enjoyed excellent B&B accommodation. We knew this was going to be a tough competition; with the grade so far being dominated by Irish and NI bands and with only three non-Irish bands in our qualifying heat, we were only too well aware of how hard we’d have to work if we wanted to win a place in the top six! Our qualification went well, with fifth and third places from the judges, but we really worked hard in the final winning two third places for piping, and fourth for drumming and ensemble. This gave us third place overall, a result we were thoroughly delighted with! Our hard work had paid off but we’d also like to acknowledge the invaluable assistance of Matt Wilson from Field Marshal Montgomery Pipe Band in helping with the tuning of the band. Once back in Belfast and with everyone in high spirits, we enjoyed a meal out together before letting the more energetic band members party late into the night. Our first performance in May was as part of the Homecoming Scotland, Road to the Worlds event, which involved us playing at the Murrayfield Magic weekend of Rugby League fixtures during the first weekend in May. The band performed both days, playing all 14 team coaches into Murrayfield and helped draw public attention to the forthcoming 2009 World Pipe Band Championships which will be held at Glasgow Green on August 15th. Several thousand spectators descended on Murrayfield for the weekend and the band enjoyed playing to continually appreciative crowds in the carnival atmosphere surrounding the stadium. Our first outdoor competition of the Season was at Dunbar on May 9th. This was probably one of the coldest days we’ve ever competed on, with a strong chilly wind blowing squally showers across the competition field making it a tough day for all the bands entered. That said, the rain held off for our Grade 4 performance and drawn 4th out of 25 bands, we fielded 15 pipers and a large drum corps. With a rocky start it took a while for the band to settle but we were delighted when the drum corps were announced as G4 winners and the band won first place overall. Our Grade 3 performance featured our first attempt at competing with an MSR; we’d put in a lot of practice for this over the months beforehand, but the bad weather and competition nerves combined to deliver a less than satisfactory performance. That said we still managed to place 6th out of 11 bands but acknowledge that we’ve a lot to work on before the next MSR outing at Melrose in August. One week later, and a week earlier than normal, the Scottish Pipe Band Championships were held once again at Dumbarton and marked the beginning of the Major Championship Season for 2009. This was our first competition in G4A and after a solid tune-up and a bracing 9:27am performance in the Qualifier, we were delighted to make it through to the Final. After enduring a 5-hour wait for the Final, we tuned up well and managed to keep momentum going through the performance. But a bad start and some slack playing from the pipers meant we didn’t deliver the performance we had hoped for. However, when the results were announced, we were very pleased with a 4th place overall, but even more delighted with the announcement that the drummers were the Scottish G4A Champions! Well done to everyone and many thanks to Matt Wilson for his assistance. And on the fund-raising front, the band performed at two late-night Beat Retreats during May, one at the Royal Yacht Britannia on May 15th and the other at the Mansfield Traquair on May 19th. April began with a mini-band performance for a group of corporate clients from South Africa at the Scotsman Hotel on the Bridges in Edinburgh. However, the main focus for April was the Lothian and Borders mini-band competition at Peebles. The band had an excellent day, placing first and second out of 20 bands in Grade 4 and reclaiming the trophy we won last year. But we also played up to Grade 3 and managed to win this grade with our second band placing fourth. With 14 bands entered this was an amazing result and a great achievement for everyone involved! This month, the band returned to its more typical form of public outing with a couple of parades through Edinburgh. First off was a parade along Rose Street followed by a televised performance in front of the Scottish Parliament for Friends of the Earth Scotland. The band led the parade of staff and supporters, some dressed as penguins, to draw public attention to the proposed Scottish Climate Change Bill. And our second parade of the month featured the largest band we’ve ever fielded, with 18 pipers and 12 drummers leading the first St Patrick’s Day parade from St Giles to St Patrick’s Church in the Cowgate. Over 200 people followed the band and church members down the Mile before attending a special Mass at St Patrick’s. Finally, we’d like to extend a warm welcome Erin Allenby, originally from New Zealand, who joins us from the Williamstown RSL Pipeband in Melbourne and Michael Binder who has moved to Scotland from Austria; both have joined the drum corps. And also to piper Clare Miller who joins us from the Grampian Police Pipe Band having recently moved to Edinburgh. Our sponsorship by John Lewis was officially marked with a photo shoot and press release towards the end of February. We arranged for award-winning Edinburgh photographer David Bryce to take some shots of John Lewis’ Community Liaison Officer, Ken Miller, handing over a cheque for £4,000 to band members Rebecca Anderson, Cameron Tulloch, Andrew McCaig and Lewis Blyth.Ken Miller noted that “Stockbridge Pipe Band are beacons for Edinburgh’s proud heritage, and we’re proud that our donation enables them to carry on promoting their good work throughout the world.”We hope that John Lewis and Stockbridge Pipe Band have forged the beginnings of a successful partnership for the future. We’re proud to carry the John Lewis logo with us on our travels across the globe. And on the subject of travels, we are delighted to announce that we will be participating in this year’s Interceltique Festival in Lorient, Brittany. This annual gathering takes place in the heart of the city every August and features Celtic traditional, classical, folk, jazz and rock musicians, singers, dancers, painters, sculptors, writers and other artists. Participants are invited from Brittany, Cornwall, Wales, Ireland, Scotland, the Isle of Man, Cape Breton Island, Galicia, and Asturias. One of the highlights will be the spectacular Grand Parade of Celtic Nations, in which more than 3,500 musicians, singers, pipe bands and dancers from all over the Celtic world parade through the city in national costume. The band members are really looking forward to this trip and we will be working hard over the coming months in preparation for the parades, shows and competitions which occur during the Festival. On 13th December the band held its Christmas Party at the Voodoo Rooms in Edinburgh before moving on to Cafe Royal for the rest of the evening. As well as the usual fun and frolics, this year included an award for the most improved piper and drummer. Peter Sharp and Shane Finnegan were the respective winners and each received a £50 gift voucher courtesy of John Lewis. And, despite some pretty sore heids, we managed to muster a band of 25 players the following day to perform at the charity Santa Stroll in Princes St Gardens. Everyone in the band donned a Santa outfit and donated £10 to the two charities, Radio Forth’s Cash for Kids, and When You Wish Upon A Star before playing for the opening of the Stroll as a sea of 2500 Santas set off for the Grassmarket. The band held its AGM on 18th December. We enjoyed an immensely successful year in 2008, and along with the competition success, the band has continued to grow to over 50 members. Highlights of the year included a short trip to Provence, appearances on Channel Four and CBBC and of course winning four Major Championships and our promotion to 4A. The band has also helped initiate after-school piping classes at Stockbridge Primary School and is currently helping to get a similar scheme for piping and drumming up and running at Davidson Mains Primary School in early 2009. The AGM saw a shift in Pipe Sergeant personnel with Ken Ross stepping down as the number two PS and Scott Forrest filling this role from the beginning of 2009. Ken has been with the band for over ten years and in that time has provided excellent tuition for pipers and will continue to assist in this role. Scott joined us over six years ago, was soon voted into the PS position and has since helped nurture the band as it has grown and developed. A valuable player and all-round band member, he now feels it is the right time to take a step back and let someone else fill this position. So we are delighted to announce that Blair Milne, formerly of Grampian Police Pipe Band, has now joined the band and will fill the role of Pipe Sergeant. A competent player with valuable competing experience, Blair will be helping Euan and Andrew set up the band for the 2009 season. We also wish to extend a warm welcome to Tony Park, Ross Martin and Louise Park from the Penicuik Pipe Band, Stephen Moggach who formerly played with Buchan Pipe Band, Claire Loftus from Seafield and District, Val Clark and Kathryn Wylie who have all recently joined the drum corps. Welcome also to Dave Shewan, Gerald Blyth, Lewis Blyth and John McLaren who have joined the pipe corps, and to Michael Green who returns to us after a couple of years break. Despite the band taking a four-week break, we were out on 27th September, performing at the Solid Rock Cafe in Glasgow. Earlier in the year, we had offered a performance from the band as an auction prize at the Macmillan Cancer Charity Lunch in Glasgow. The highest bidder committed over £3,000 to charity, and secured our services for a birthday bash at the Solid Rock Cafe©. The band enjoyed an excellent night out, playing to a packed crowd of enthusiastic partygoers! We restarted practices in mid-October and immediately began work on the new tunes for the 2009 season, as well as resuming our teaching programme. At the beginning of November the band led the Port Seton Remembrance Parade and, at the end of the month, we took our customary place at the head of the annual St Andrew’s parade, this time down the Royal Mile in Edinburgh. Whilst Cowal may have been the final Major contest of the Season, the final Branch competition was held at Peebles Highland Games on September 14th. Knowing that we were at the top of the Branch table, our goal for the day was to take the largest band out that we could muster and aim to place as high as possible. Fielding 15 pipers, 8 snares and 5 mid-section players, we were happy to place 5th overall with the drummers placing a very credible 2nd out of 18 Bands. And congratulations to the mid-section who won their third Best Bass section award of the Season! We also competed in the Grade 3 competition and, having had some rather poor results from our attempts previously in the season, we were delighted to place 6th out of 15 Bands, with the pipe corps also placing 6th. So the Season finally ended with the Band being crowned Lothian and Borders Branch Champions both as a Band and as a drum corps, and with these trophies in tow, we marched proudly up the street and into the pub for a well-deserved pint! As the Season ended we had to say goodbye to some friends from overseas. Amos Van Die, who despite being based in St Andrews had been keen to play with us during the summer, returned home to Ottawa. And we also had to bid farewell to Rob McKenzie, who returned to Toronto having completed his studies. During the 2008 Season Rob committed a lot of time to helping us improve our playing, maintain our sound through both qualifiers and finals and generally giving tips and advice to everyone to help improve our overall standard. We wish Rob all the best for the future and look forward to hopefully seeing him again in 2009! We also wish to thank Scott Walsh of the House of Edgar Shotts & Dykehead Pipe Band who has spent a lot of time this Season helping Andrew with the scores and our drummers to improve their playing skills. Thanks also to Stu McHale from the Hamilton Caledonian Society Pipe Band of New Zealand who spent time with our mid-section earlier in the Season whilst working in Edinburgh. And finally, thanks to Blair Milne of Grampian Police Pipe Band who has helped out continually throughout the Season both at practices and competitions. The biggest thanks of all, however, goes to the Band members and supporters. Thanks to all the players for their commitment, energy and drive which has made this such an excellent Season. Thanks to Mr M for looking after the refreshments, Sara for her high-spirited treats, to Willie our coach driver for being exceptionally accommodating and a willing participant and thanks to all the helpers and supporters, families and friends who kept us motivated throughout the Season. The Band is now taking a well-earned break until mid-October when we will resume our winter practices. Still glowing from winning our second Championship in a row, the Band settled down for a busy month of non-stop competing. So, with high hopes we headed east to the wet and wonderful North Berwick Highland Games on the 9th August. Traditionally a sunny event, this year’s Games were shrouded in persistent rain which turned the field into a muddy marsh. We were on 11th out of 15 bands in Grade 4 and were delighted to win first place in the Open competition as well as best drum corps in G4. We also won both first places in the Lothian and Borders Confined Branch competition. The following day, we travelled up to Perth Highland Games. Having surpassed ourselves the previous day, we had a very poor run and placed 8th out of 24 Bands. The drum corps, though, were deservedly pleased with 2nd place. The week of the World Championships began with a solid practice on the Monday night. Then, throughout the week, the Piping Live festival in Glasgow provided non-stop piping and drumming highlights in the build-up to the Worlds. The day itself dawned earlier than normal for the PM, who after a wedding in Essex the day before flew up from Stansted at 6am, arriving bleary-eyed at Glasgow Green in time to finalise the Band’s tune-up (many thanks to Scott, Rob and Blair for getting things going) before the qualifier at 9:18am. We were delighted to qualify with two 1st places from this heat of 13 Bands and took some time to rest before the warm-up for the final in the afternoon. A solid tune-up saw us heading to the line in good form. Nerves kicked in just at the beginning but we settled down into a steady performance and marched off pleased to have made it into the Final for a third time. Entering the arena for Massed Bands, we were confident that, with two wins behind us, we had played well enough to place somewhere in the top six, but none of us could quite believe it when first the drum corps were announced World Champions and then the Band were also announced as 2008 World Champions!! Nothing can beat this feeling, slightly surreal though it felt at the time! We were absolutely delighted; tears, hugs, silly grins all abounded as we congratulated each other! With both titles in the bag and the trophies there in front of us to confirm it, we were on cloud nine. And if this wasn’t enough excitement for one day, we had a wedding to celebrate as well! Congratulations to our piper Colin and his lovely wife Sharon who were married earlier in the day. Colin missed playing at the Worlds, but our trip home was via their wedding reception, at which we gave the ceilidh band a break by playing a few sets before celebrating the occasion with the Bride and Groom. One week later, all this excitement was behind us as we competed at Melrose Pipe Band Competition in a bid to extend our lead in the Lothian and Borders Branch Table. We were now determined to go all out in an attempt to win both the Branch and Champion of Champions. We didn’t play as well as we could have done at Melrose but, nevertheless, the drum corps placed 1st, the pipers 5th and we placed 3rd overall out of 11 Bands, securing another 5 points. And with these points, we also secured our Branch Champion of Champions position for both the Band and the drum corps for 2008. And so the final Major rolled round on Saturday 30th August. An early start saw us arrive at Dunoon in Argyll for the Cowal Championships by 8:30am, despite a few people missing the 5:45am pick-up! In weather that was a wee bit chilly and slightly overcast we tuned up quickly, accepting that the sound wasn’t going to get any brighter, and concentrated on nailing our attack and ensemble. Qualifying comfortably with a 1st and 2nd placing, we then had an arduous 5-hour wait for the Final. It takes a lot of effort to keep a Band motivated between two performances so far apart, but our determination to strive for a fourth win kept us focused. The afternoon brightened a little and we warmed to this final assault with a confident drive, playing well but wearily! And as we entered the arena at the end of the day, at the back of everyone’s minds was the million-dollar question; have we done enough to win again? We knew we had already won the Supreme Champions as a Band thanks to our previous placings, but the drum corps still had a point to gain to secure their place in the Champions league. Burntisland won the best drum corps and, whilst delighted for them, we all began to wonder where we’d place. But our commitment had prevailed and we were delighted to hear Stockbridge announced the 2008 Cowal Champions! The subsequent announcements for 2008 Supreme Band and Drum Corps Champions were lost in the mêlée as we hugged and cheered, relieved and delighted with the result. So with three trophies secured, and with a little street party fancy dress courtesy of the drum corps, we took our place in the queue for the final parade through Dunoon, heads held proud as we weaved our way to the foot of the High Street. Congratulations to both Burntisland and Stamperland on an excellent season; two challenging adversaries who’ve kept us on our toes for the past few months! July is traditionally a quiet month between the Major Championships. To keep us going we had planned to go to Stirling Highland Games but this year’s pipe band competition was cancelled in favour of a massed bands display. So instead we headed north to Cupar Highland Games on Sunday 6th and despite persistent rain all day, we were pleased to win 2nd place in G4, 3rd in G3 and 3rd in an open G2 competition. The rest of the month was spent preparing for the European Championships in Lisburn, NI, on the 26th July. We left Edinburgh at 6:00am on Friday morning, catching the ferry from Stranraer and were in Belfast for 12 noon. As short drive took us to our accommodation at Stranmillis University campus on the south side of the city. After a leisurely lunch we had a brief practice in the afternoon before the heavy skies broke. And after a few beers over dinner it was an early night all round; we almost all round! Everyone was up bright and early on the Saturday morning and after an quick breakfast – thanks to Dave and Henry for their help with this – we took the short drive to the competition grounds. Having arrived in plenty of time, we had a leisurely tune-up and, playing well, placed 1st in our Qualifying heat. The day brightened up from here on in and it began to get quite hot, so we concentrated on a well-paced tune-up for the Final in the afternoon. We were pleased with the performance with each corps again gelling well as a unit and producing a strong band sound. And we were delighted to be announced the G4b European Champions for 2008! Again, a lot of hard work over the past few weeks paid off for everyone and the well-deserved celebrations continued late into the night! Congratulations to Everyone. This month got off to a glamorous start with the Band performing at the Vodafone T4 concert in Princes St Gardens on 1st July. Along with the Sugababes, The Feeling and the Hoosiers, the Band entertained several thousand revellers in the shadow of Edinburgh Castle. And if that wasn’t exciting enough, the Band were also commissioned by Channel Four to film a live link with the Sugababes which was shown on T4 as part of the concert coverage. Playing a rendition of ‘About You Now’ four of the Band’s members appeared, albeit briefly, with the Sugababes and T4 presenter Dave Berry. You’d think that one filming gig a year was good going but straight off the back of the T4 event, we were asked to film for CBBC the following day! Williamston Primary School in Livingston was the venue for the filming of the children’s programme ‘Help! Teach is coming to Stay’ in which a teacher must learn two of her pupil’s hobbies over a weekend and is then tested on one of them the following Monday. Our poor teacher was learning snare drumming and ballet and landed herself a 20-minute theory and practical test with Arthur Cook, Leading Drummer with the Lothian & Borders Police Pipe Band and a short performance with a mini-band, courtesy of ourselves. Filming fun out of the way, the Band then knuckled down to performing at several ‘bread & butter’ gigs throughout the rest of the month; Leith Pageant, Stockbridge Primary School Gala, Davidson’s Mains Gala and Bo’ness Children’s Gala Parade. In between, we competed at the third Branch competition at Innerleithen, where we placed 1st overall, winning also Best Drum corps and Best Bass section. Our final outing of the month was to the British Championships in Birmingham on the 28th June. We travelled down on the Friday night after work and arrived at our Hostel in time to get a decent night’s sleep before heading off to Cannon Hill Park on Saturday morning. Our tune-up went well for the Qualifiers and we placed 1st from both judges. After a short rest we re-tuned up for the final and after a good, steady run we were pretty pleased with the way things had gone. And, when the prizes were announced for G4B, we were ecstatic to be crowned G4B British Champions for 2008. A lot of hard work from everyone in the Band paid off with a cracking result! Well done to everyone; many thanks to Rob and Amos for their assistance and thanks to all our supporters who made the trip south to cheer us on. The spring season has been a busy and successful time for the band. In April, we attended the Lothian & Borders Branch mini band competition, held at Peebles High School. In a field of 24 bands, we were delighted that our ‘A’ band won first place in Grade 4, with the ‘B’ band finishing in 8th place overall and winning the drumming as well. And at our first attempt at the Grade 3 mini band competition we placed 8th out of 14 bands. Next up was the first outdoor competition at Dunbar on the 10th May. A far cry from last year’s cold and wet event, the skies were blue all day but there was still a coastal chill to the air. We had a good position in the Grade 4 heat and fielding a full band played well, if a little rushed. Finishing 2nd out of 22 bands was a cracking result and we were delighted to begin the outdoor season with a prize! Between Dunbar and the first Major of the season, we were lucky enough to be invited to perform at the Fête de la Crau in Fos Sur Mer, a seaside town in southern Provence. We flew out on the 17th and returned nicely bronzed and culturally topped up on the 19th before heading straight to practice that evening. A full trip diary will be posted soon. And, then it was the Scottish Championship at Dumbarton on the 23rd May. We had been working hard for this and knew we had to keep our qualifying reputation intact; we had a good draw and as forecasted, the weather was excellent. That said, our morning tune-up was rushed and we were also rushed to the line a little early so the playing in the qualifier was not the strongest performance we can muster. None-the-less, we qualified in 2nd place and secured our position in the final. We had a much more relaxed and structured tune-up for the final but some frustrating mistakes and bad blowing form the pipe corps didn’t give us the confident run we had hoped for. So we were exceptionally pleased to place 4th overall with a 2nd place for ensemble and an excellent 2nd place for drumming. However, it was a quiet bus journey home; gluttons for punishment that we are, we were booked to play at Hopetoun House later that evening and needed to be in tiptop shape for this gig at 11:30PM! In fact we’ve had a busy run of Beating Retreats; along with the event at Hopetoun House we also performed at anther two engagements at Winton House in East Lothian as well. Our final outing in May was at Bathgate Highland Games on the 31st May. Another lovely day, we fielded a large band, with some first time appearances within the pipe corps. Unfortunately, bad blowing left us in 5th place for piping, with the drummers in 2nd place and out Bass Section winning Best Bass. Thus a 5th place overall. After a well-earned break over the Festive period, the Band resumed practices in early January and within weeks were back out performing, first with a mini band at Craigiehall Officer’s Mess Burn’s Supper on the 25th January and then at the John Lewis Under-18 Youth rugby Cup Final at Murrayfield on the 26th.. The Band’s AGM was held at the end of January at which Craig McGuire stepped down as Drum Sergeant and Andrew McCaig accepted the position. We wish to thank Craig for his immense impact on the Band during his time with us as leading tip; he has been instrumental in building our competitive drum corps and attracting new players and hopefully will still find time to play with us this season. Andrew joined the Band last year and was previously Drum Sergeant with the Loretto School pipe band in the late 90s. Progress has been excellent over the past few weeks and we’re all looking forward to the start of the competition season. And we’re pleased to announce that we are heading abroad again, this time to France to perform at the Fete De La Crau Festival, which takes place in the seaside town of Fos Sur Mer, 50km north west of Marseilles. The Festival runs for four days from May 16th and the Band will be accompanied by five of Scotland’s finest young Highland Athletes who will be taking part in a friendly Highland Games contest with competitors from Spain and France. The Band recently returned from an excellent 12-day trip to Mexico appearing at the inauguration of the UNESCO Forum in Monterrey and also the 5th International Folk Festival in San Luis Potosi. A full trip diary will be available soon along with an updated photo gallery. Practices resumed in October for the winter season and we are currently looking to boost our ranks for the 2008 season. As is customary we have had to say goodbye to some band members but also welcome new players into our ranks. Farewell to Catriona Sneddon who leaves us to play for the Pheonix Honda Glasgow Skye Association Pipe Band in Grade 2, and Kirsten Reid and Michael Lawson who have both joined the City of Edinburgh Pipe Band in Grade 3A. We’ve also had to say farewell to Tyler Irving who has returned to Canada to take up a teaching post at the University of Toronto and will shortly be waving off Ross Cameron who has reached the end of his teaching placement and will return to South Africa at Christmas. It’s been a pleasure having you both with us this year and we hope you keep in touch and visit soon. On the plus side we welcome several new players. Additions to the pipe corps include Kate Spolwart who joins us from Duns Pipe Band, Michael McGillis who joins us from the University of Bedfordshire Pipe Band, Alan Ballie who recently played with the Edinburgh Postal Pipe Band and Jim Orr who has recently moved to Edinburgh from England. We’re also pleased to welcome Blair Milne who plays with the Grampian Police Pipe Band but is currently working in Edinburgh. And also Rob McKenzie who joins us from the G2 Glengarry Pipe band in Canada. Rob is currently studying in Edinburgh and hopes to be able to help us out during the 2008 competition season. We also welcome tenor drummer Julie Gerkin from the Lothian & Borders Police Pipe Band, and Shane Finnigan, Steven Durie and Alyson Hainey who have all joined the drum corps. Over the past few weeks the Band has been working hard on the new MAP tunes for the 2008 competition season as well as performing for the annual St Andrew’s Day parade and the Wish Upon A Star charity Santa fun-run held in Princes St Gardens on the 16th December. And on the 8th December, we held our Mexican-themed Christmas Party at Viva Mexico on Cockburn St, where amongst the seasonal festivities, our Mexico DVD premiered to 40 band members, family and friends. Well done and a huge thank you from everyone to Hazel for all her hard work in completing another excellent record of this major trip! The Band is now resting over the festive period and will resume practices in early January. Our competition season for 2007 has now finished and our attention turns to the forthcoming trip to Mexico at the end of the month. Practices have been focused around the one-hour long stage shows we will be performing, and involve getting together with dancers from the Jane Knox School of Dancing in Dunbar to rehearse our various sets. Everyone’s getting pretty excited now as the trip gets closer, and many of us will be sporting some fine navy polo shirts, embroidered with the Band logo and trip details, which have been produced specially for the occasion. We’ve also been busy preparing a 30-minute DVD which features some of the Band’s past performances this year and insights into the typical Band setup, uniform and the principal Highland Games events. The DVD will be distributed when we are in Mexico and will hopefully prove entertaining and informative. Many thanks to Hazel for all her hard work in collating and editing the footage. Once we return there will be a short break, with practices resuming on Monday 22nd October. The first competition of the month was North Berwick Highland Games on Saturday 4th. We were drawn sixth of 16 bands in Grade 4 and, after tuning up in good conditions, took to the field at 10:35am. A solid start and good progression into the circle was spoiled by numerous errors in the final parts of the set. Disappointed, we marched off and tuned up for Grade 3. We were drawn second of 13 bands and headed to the line for 1pm. We had a good run, and whilst the playing was not perfect, everyone enjoyed the opportunity to play a varied medley. The afternoon was spent basking in the rare and glorious sunshine with cold beers as we listened to the Grade 1 and 2 competitions. We were very pleased to be placed fifth overall in Grade 4, pipped for fourth place on an ensemble preference. We also placed third in the confined Branch Grade 4 competition. After leaving the field, we swiftly marched down the street and into a local bar before adjourning to former band member David Anderson’s house for more refreshments, food and entertainment. Many thanks to Gillian and Neil for having us. The following weekend was the World Pipe Band Championships at Glasgow Green. The odds were not in our favour with three heats of 15 bands and only four from each going through to the final. With our coach turning up 30 minutes late, and thus only arriving in Glasgow an hour before we were due to go on, it was a very hectic tune-up in the beer tent as we avoided the persistent rain. Going straight from the tent to the line, we were delighted to place third equal and so qualify for the final. However, we weren’t drawn to compete until 3:20pm and, thanks to the continual rain, it was a long five hours spent on the coach as we waited to tune up. It proved very difficult to get everyone fired up for the final performance and although we tuned up well, we really lacked the drive to give a solid performance. That said, we were happy to be placed tenth overall in our second ever World Championships – and even happier to get aboard the coach after massed bands and head home! Subsequently, Perth Highland Games on the Sunday was cancelled due to the awful weather. Melrose Pipe Band Championships took pace on Saturday 18th and whilst not a clear sunny day, the rain held off. We were only able to field two snare drummers for this competition but persisted in playing and placed seventh out of 14 bands, with a fifth for piping. This was our final Branch competition of the season which saw us placed second in Grade 4 behind Newtongrange. Unable to make Peebles in September, we fully expected Duns to perform well and push us into third place. The final Major of the season was Cowal Championships, held in Dunoon. We had the pleasure of being drawn to play at 9:42am which meant leaving Edinburgh at 5:30, but we made swift progress and arrived in good time to tune up. Intermittent showers proved awkward but we took to the field with confidence and placed fourth out of the 12 bands in our heat. The weather cleared for the afternoon and we marched up to the line for the final ready to do battle. But rushed playing towards the end of the set meant a less than perfect performance, and we placed ninth overall, with a sixth place for ensemble. Our tone was solid and the overall band playing and sound was tight but the finer points of our performance were lacking and this showed in our placing. It had been an enjoyable day’s competing, though, and a good end to the season. Fully charged, we marched down the street at the end of the day, accompanied by a neon pink-haired young Drum Major who kept the crowds cheering with her flourishing, before hopping back on the bus and partying over the Firth of Clyde and back to Edinburgh. June was as busy as usual. At the beginning of the month, 27 band members and 6 Highland dancers flew to Bergamo in northern Italy for three days to participate in the 7th Lo Spirito del Pianeta festival.Upon our return, the band performed and competed a total of eight times during the month.Leith Pageant, on June 9th, was hot and sunny; a rarity compared to the rest of the month. Fielding a sizable band we participated in the parade down Leith Walk towards Leith Links and did a quick turn for the assembled crowds. The following Saturday saw us field two bands on the same day. Fourteen Band members led the parade at Davidson’s Mains Gala Day under cloudy skies from the high street along to Lauriston Castle grounds. And at the local Branch competition in Innerleithen, the competing corps placed 5th overall in G4 with the drummers winning the Best Drum Corps trophy! We also competed in G3 but principally to give us another chance for feedback on the G4 set; despite being placed 10th overall out of the 11 bands competing, the drummers did very well and were placed 6th beating several G3 bands. Well done and thanks to everyone that played; fielding two large bands at the same time takes a lot of commitment from everyone involved, but equally highlights how far we have come over the past few years. On Saturday 23rd July, we made the long trip to Ballymena to compete at the British Championships. Setting off from Edinburgh at 00.30 hrs we drove through the night across Scotland to Stranraer where we boarded the 4:45am sailing. Two hours later we were docking in Belfast and a short drive north took us to the Ballymena Showgrounds, arriving just before 8:00am. We had an excellent draw, playing second last at 11:08 so there was plenty of time to get settled in. Tuning up went well and as we moved across the park to the final tuning area everything was coming together. A steady attack and reasonably controlled playing saw us place joint third along with Fraserburgh and Irvine Memorial and thus qualify for the final. We weren’t due to play in the final until 4:20pm so, after lunch and a couple of hours kip, we headed back out. Again, things were settling down well and as we approached final tuning the band was sounding very solid and confident. Unfortunately, we peaked a little too early and had to wait five minutes until we could play. It was still a steady performance but we lost a lot of integration towards the end and, in a rather stiff field of bands, finished 9th overall with the drum corps earning a 5th place. Many thanks to David and Neil for their assistance tuning the drones. The ferry back was a great laugh, but once back in the bus most people were soon fast asleep as we headed back east across the country, arriving in Edinburgh at 5:00am. Despite this late return home, some of the band, accompanied by those who hadn’t been competing, managed to get themselves back out again for the Bo’ness Kirkin’ parade on Sunday. Friday 29th saw us out at Bo’ness Gala Day parade where, along with several other pipe, brass and reed bands we marched through the town under clear and sunny skies. STOCKBRIDGE PIPE BAND, EDINBURGH | Powered by Mantra & WordPress.